The blog took a break while I was moving, finding an apartment, and acquiring a job in Boulder, CO. Now that everything has settled down the posts will continue as the snow begins to fall outside my window. Onward and upwards with the adventures! With our campsite along the river we could see a church in the far distance. After packing up things we headed over to checkout the Church and it turns out they had a visitors area with artifacts from long ago as well as the original foundation in place 50ft from the current structure. After viewing the church we headed off the Þingvellir national park since we didn’t spend much time at it yesterday other than just gathering information. After taking in the tectonic plates and reading up on the history of the place we decided to go off trail a bit and hike in-between the North American and European plates which was amazing. 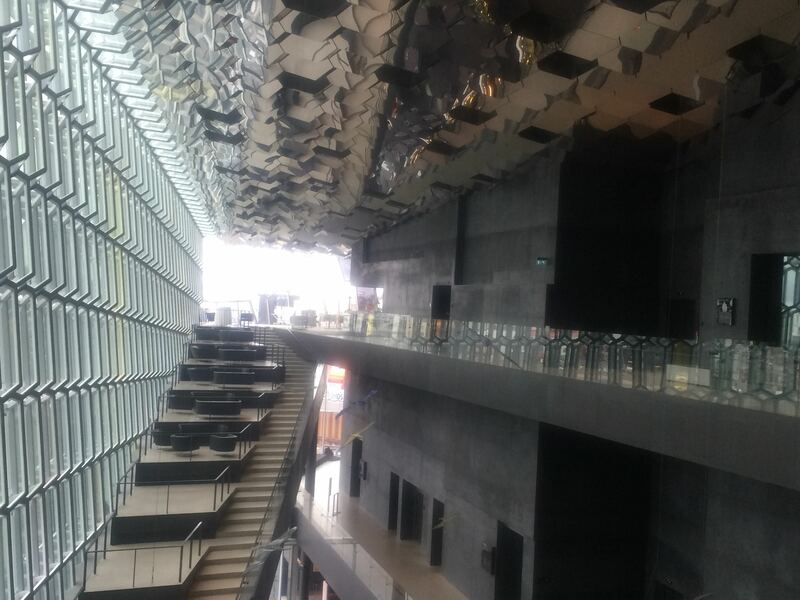 Literally in-between two tectonic plates! Right before leaving we checked out a nearby waterfall. 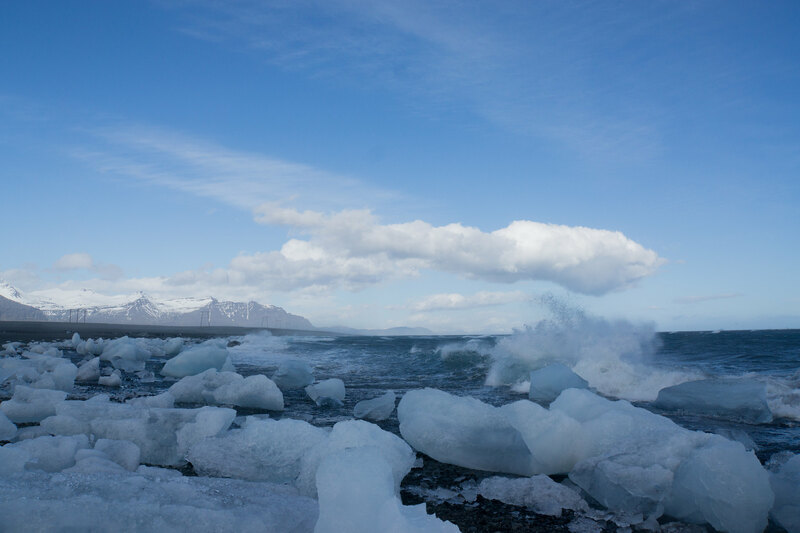 I swear this place, Iceland, is constantly bleeding with water…. everywhere…. in great abundance. 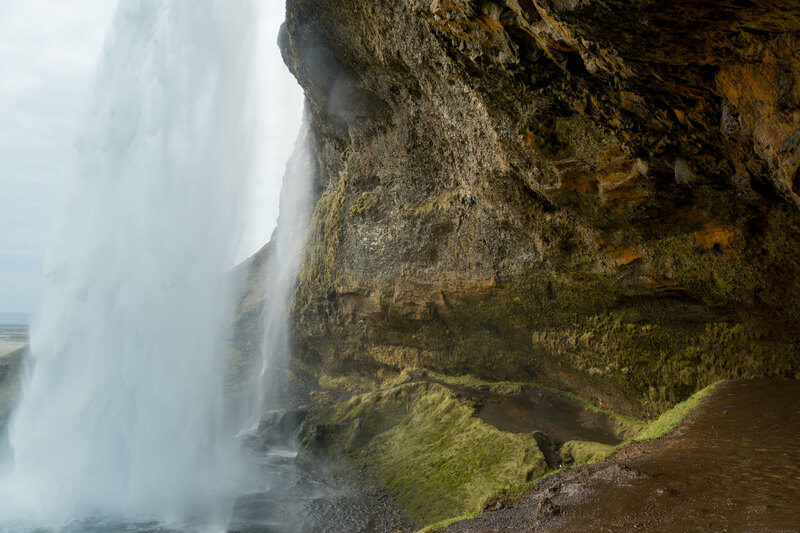 And now onto another waterfall, Skógafoss! Skógafoss was truly amazing, mostly due to the fact that you could hike in behind the waterfall where all sorts of colored moss and allege were growing. It was just a stunning waterfall under the most perfect of weather conditions. Back on the road we stopped at a vista point for the Eyjafjallajokull volcano that erupted in 2010 contributing to mass air-traffic disruption which you can read about here. Next stop up was the black sands beach with some cool basalt rock formations. 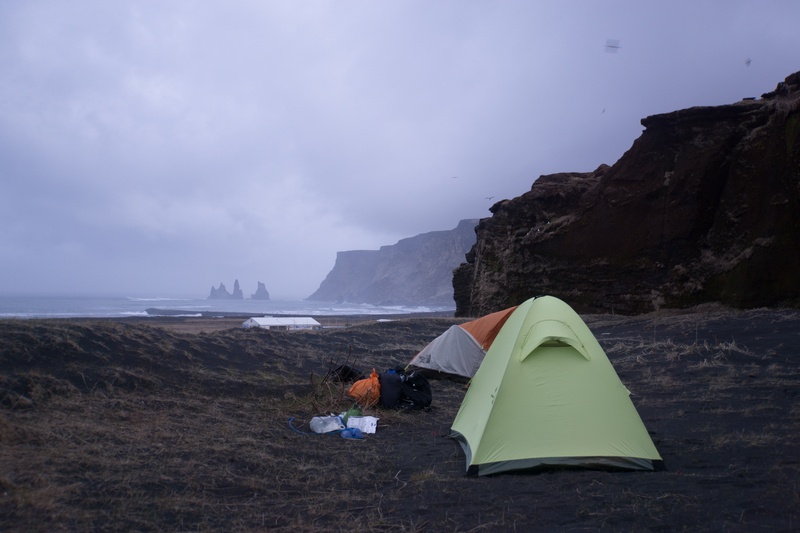 After being sandblasted on the beach we were off to Vik where we’d find a nice spot to camp high up on a knoll overlooking the town. I woke up to the bustling of others packing up their stuff and decided to lay there with the black sand forming to my back like a tempurpedic bed. It was quite nice. 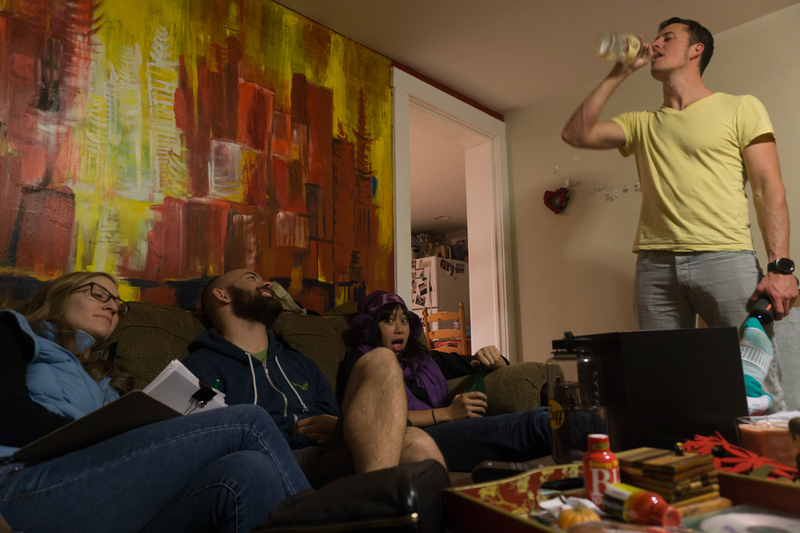 And, based on how fast we all got back up the previous night I knew I had some time. So I lazily woke and cooked up some breakfast in the tent as a nice drizzle was coming down outside, quite peaceful. As I was packing up Steve came back up and we took a stroll up to the top of tiered cliff that we had been camping on. A large community of birds had made their home on the hillside so we took a bit of time for observation and photography. Down at the car Aaron and Nathan were waiting so we quickly packed the suv and headed off. Of course stopping for vistas along the way our destination today was Skaftafell where we’d camp. 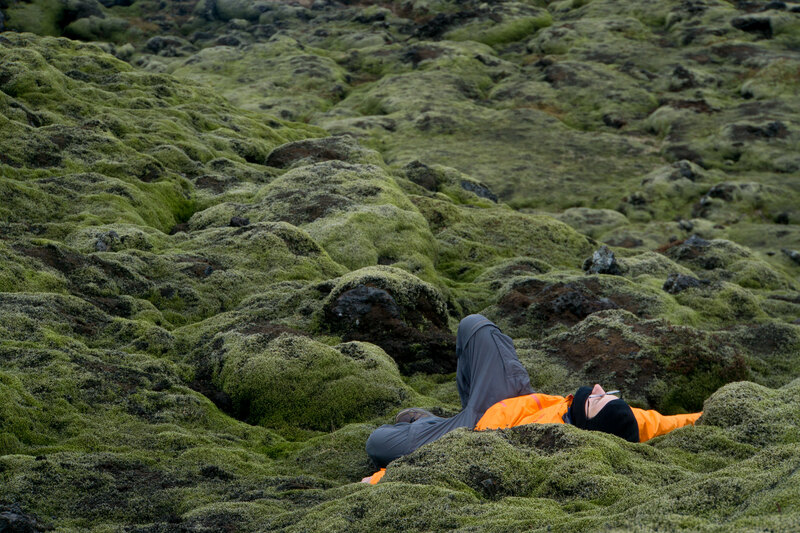 One notable stop was to admire the vastly covered moss landscape. Walking on the stuff is such a great feeling that we stayed for a bit. Arriving in Skaftafell we checked out the visitors center and got some info on the camping regulations, with it still being early in the day we signed up for an ice hike which is pretty much what it sounds like. Walking on a glacier. I don’t mean to downplay it but with it being nothing new to me I was just along for the ride. Obviously it was a cool experience none the less. For myself it was something along the lines of a campfire. All campfires are cool, fun to make, enjoyable and never get boring but once you’ve seen one you’ve seem them all to some degree. For glaciers I pretty much feel the same way, their all unique yet the same. We donned some crampons and were off! Overally we’d make one large loop on the Svínafellsjökull glacier. No injuries but one older asian lady did keep trying to cut in line which isn’t something to do when on a slippery ice shelf. Just imagine giving the general public spikes in the feet and axes in their hands, scary. One reason why I question if I want to be a guide or not. The day finished off with the “opportunity” to take pictures against a sloped ice wall as if one were ice climbing, pretty funny. I didn’t take them up since I’ve been actual ice climbing but it was a fun experience for everyone. After the climb we were all soaking wet from the rain up on the glacier. 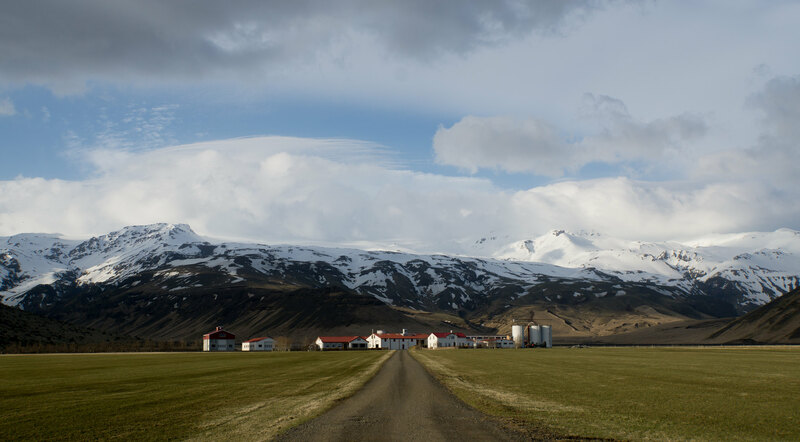 With morale low the group decided on getting a hotel room in Skaftafell and so we did. Running out of chances to camp! We ended the night soaking in a hot tub in the basement of the hotel. 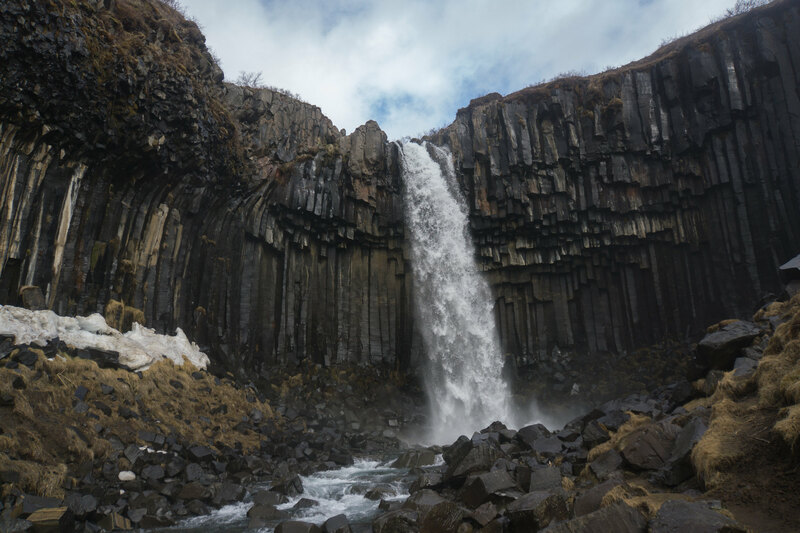 Today we would be visiting a basalt waterfall, Svartifoss, located in the Vatnajökull National Park. 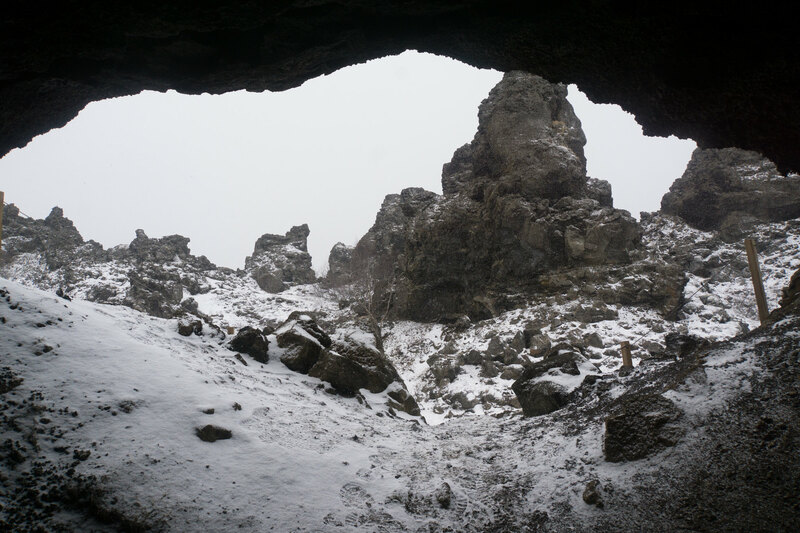 The weather was far better than the previous day which meant for easy trekking out to Svartifoss. While trekking out to the waterfall, what did we come across?, why another waterfall! We stopped to admire it and Steve got uncomfortably close to the edge. Maybe my monthly reading of the “Accidents in North American Mountaineering reports” has made me rather risk adverse in situations without ample protection, or I’ve just gotten old, but I can see why the park service puts up ample signage around these areas 🙂 It was a rather short hike out to Svartifoss and well worth it, the columns were other-worldly and we stopped to take a fair number of pictures while other tourists were accumulating. We took a different trail back to the car which led us up to a nice meadow overlooking <cite mountain> blanketed by clouds and rainfall. 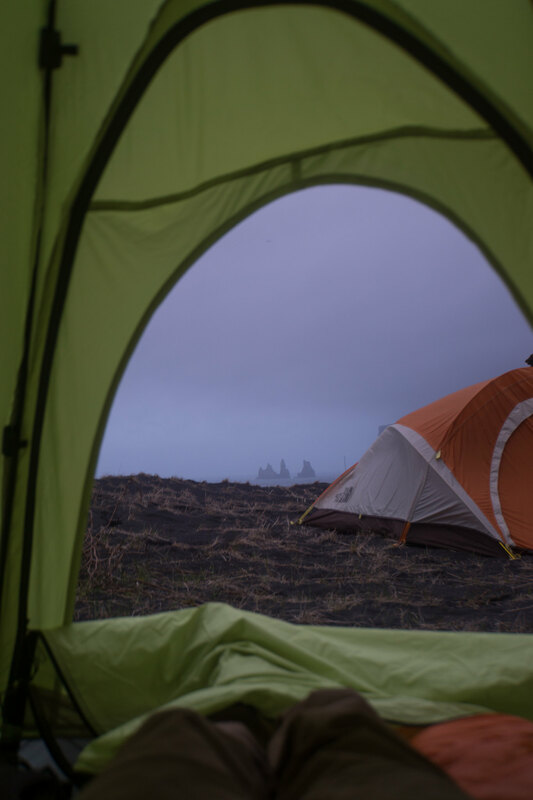 We stood in an open meadow next to a sun-dial admiring the views of the ocean opposing jagged cliffs, odd land formations in the sea, and the largest mountain in Iceland behind us obscured by clouds. While hiking back out we came across an area used for gutting and cleaning out game which was marked and designated as a fragile area. Back in the car it was time to grab lunch and with food being quite expensive we settled for a gas station hotdog, coke, and fries (approx. $16 USD). This would become commonplace for the trip. Next stop, the Fjallsárlón glacier lagoon! Breathtaking is the only way to put it and pictures don’t come close to representing it. The ice itself is hundreds of years old, very clear and solid deep blue. The beachside was insanely windy and took a bit of effort to get out to the icebergs which were all congregated on the shore at this point in the year. Towards icelands summer months the icebergs are out floating about with boat tours which go out for viewing. Our destination for the night was Höfn and with it already being late we knew we’d arrive a night. With no great opportunity for dinner we hoped something would be open upon arrival. Along the drive there were some Caribou, horses, and of course some quite interesting landscapes. At one point we stopped at a monument of sorts along the road which was devoted to Sogufero (sp) a John Muir type naturalist. 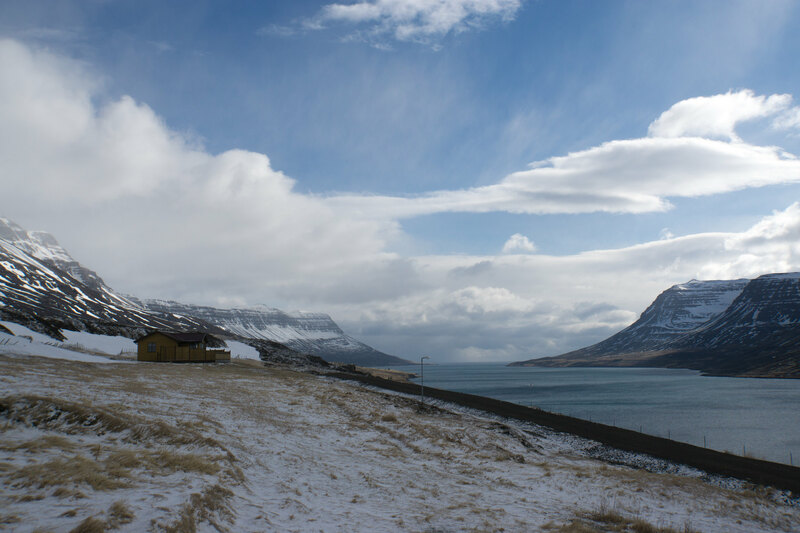 Arriving in Höfn we found a small restaurant ,Hafnerbudin, which was open and grabbed some awesome burgers there. While having dinner we met up with a girl from Utah travelling somewhat solo around the island. She was essentially with a group and left them for a few days to join back up at the end of the trip. Sounded like a good decision on her part. 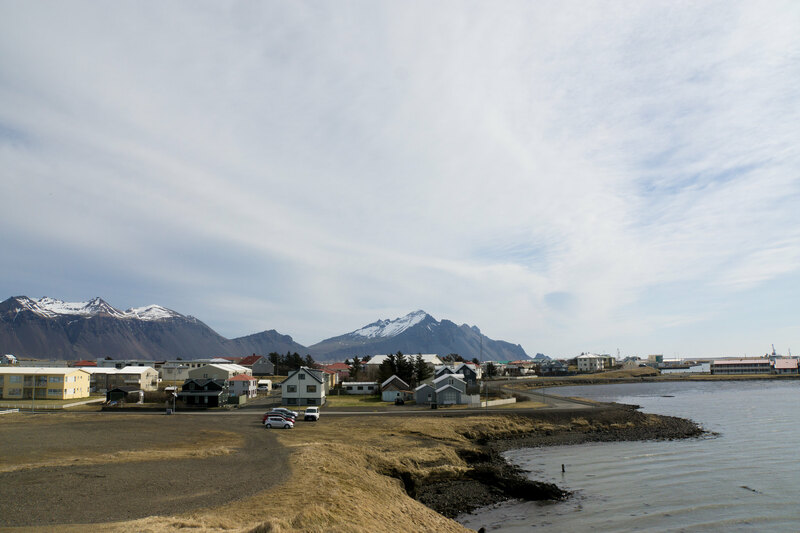 We all parted ways without exchanging contact info but she was relieved to meet up with another party from the U.S. To round out the night we played some cards and crashed at a sweet guesthouse in Höfn. Steve and I packed up a bit more quickly than the others so we walked about Höfn and came across the community picking up trash. Not that their was hardly any trash but it appeared to be a requirement for the youth to pick up all debris. If only this happened in the states. I guess one could dream. We all headed back to Hafnerbudin for lunch and upon leaving saw more cool icelandic trucks. Along with one XJ, I’m really curious how 44″+ tires work on an XJ. 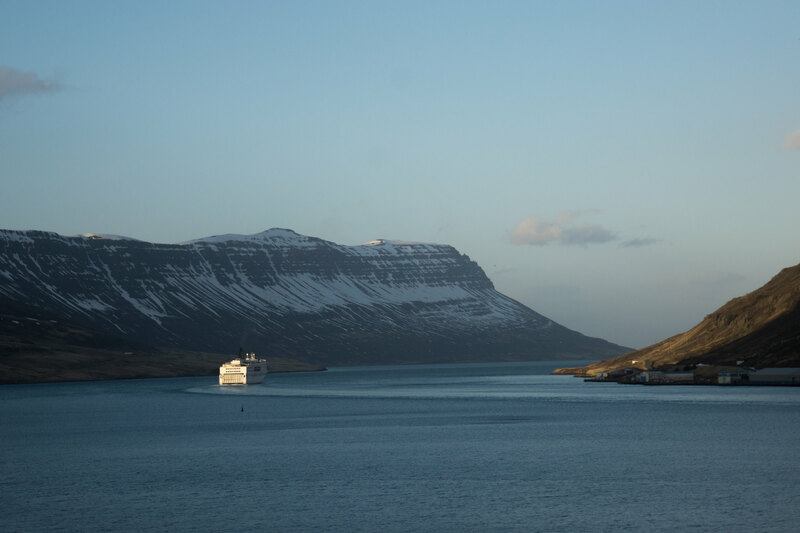 Today our goal was a guesthouse in Seyðisfjörður located in the east fjords. While driving along ring road we came across a bright orange lighthouse that we stopped at to get pictures and climb around the oceanside cliffs/rocks. Saw a few sea lions and what we thought was the top of a whale. Onwards from there we encountered numerous classic cars with racing numbers on the driving around the fjord on such a perfect day. Driving around a fjord in the east. The weather was absolutely perfect today, crisp, cool, clear and of course windy. It’s just always windy. Made a quick stop in Egilsstaðir to pickup some liquor. There’s hardly any liquor/beverage stores on the island so if you happened to find one take advantage! And this pleased AC, the lack of liquor stores is a topic that came up on a daily basis..haha. We arrived in Seyðisfjörður and met the owner/builder of the guesthouse that we’d be staying at. Cool guy and a well built place. At night we walked around the town, found a world-renowned art school, and played a bit on the schoolyard playground which had a zip-line. I mean how couldn’t you pass that up? There was a large harbour which was a point of entry for ships arriving/departing from Denmark. 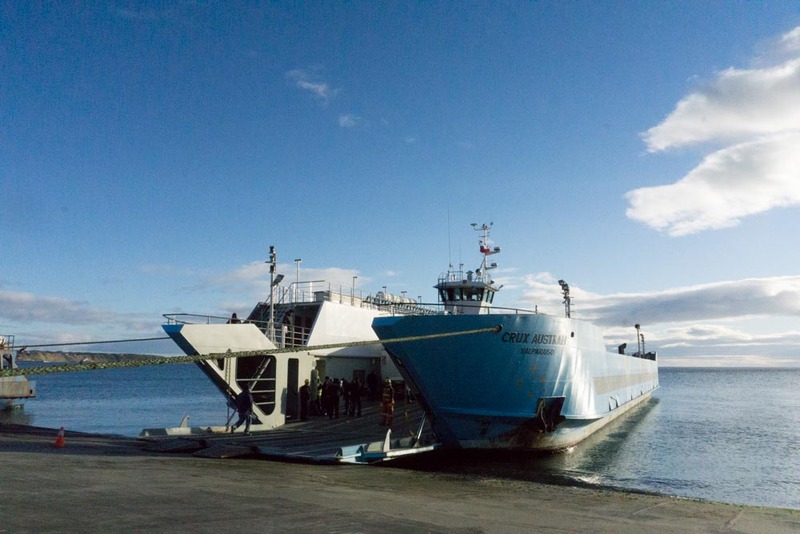 It would be pretty cool to connect a trip with one leg being ship transit to and from Denmark/Iceland. 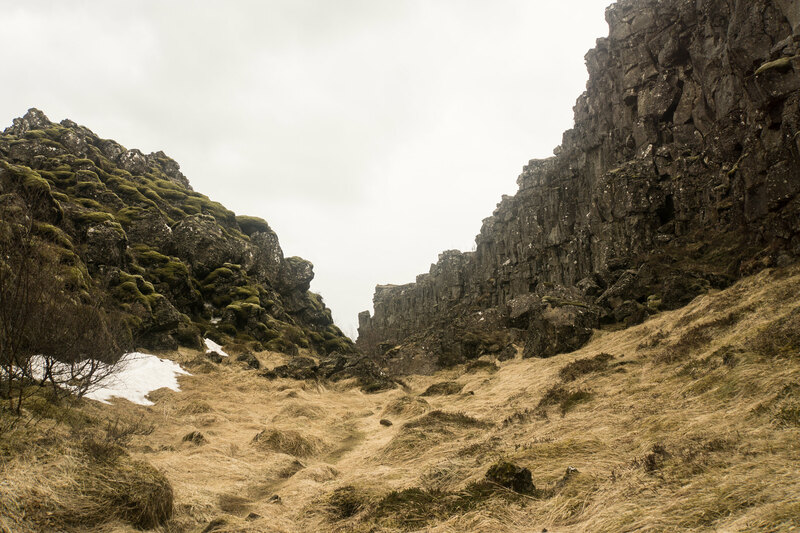 One objective of the trip was to do a 20mi one way hike through a canyon in the north part of Iceland. Specifically Myvatn. Steve was able to get ahold of a ranger and before he could finish asking them about the trail they blatantly said it wouldn’t be possible due to the conditions. 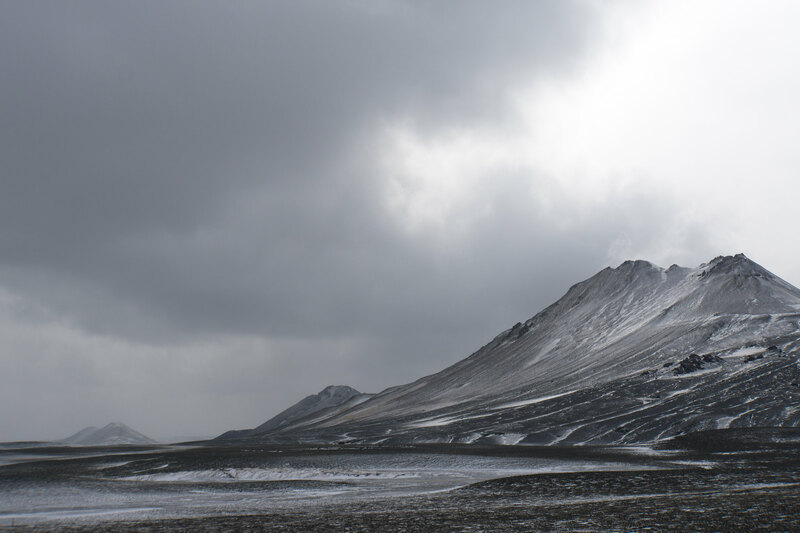 Essentially we’d have to rent a icelandic truck to get to the trailhead at $400/day and the 20miles of hiking would turn more into expedition mountaineering. So with that in mind we ditched the idea of a hike. For the most part it was our last opportunity to fit in a nice hike. So for me it was a pretty depressing moment. More time in the car and less time outside. 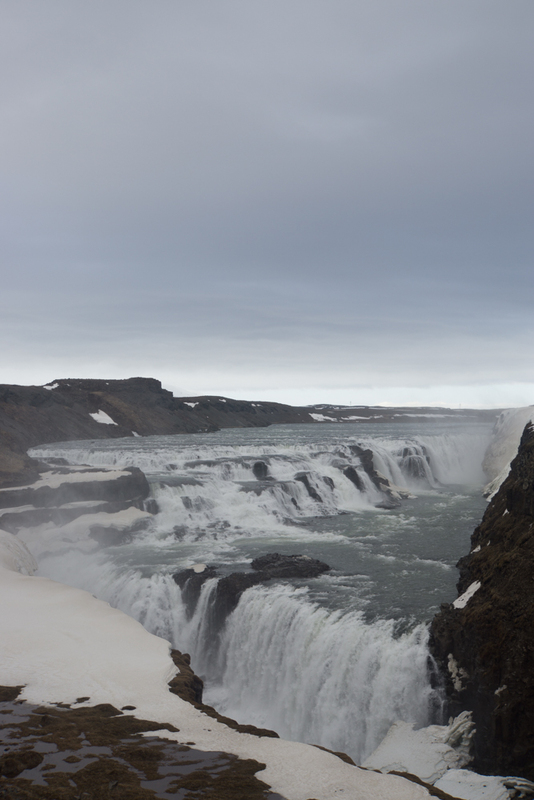 With hiking out of the picture our goal for the day was the dettifoss waterfall which was seen in the film Prometheus. While in the town of <town name><lookup> we were looking at the map and decided on taking highway ### out to the falls. One problem, the road was closed. It was closed with a small sign that had been placed in the middle of the road. The weather was alright, not much snow, the road conditions were alright. After much discussion and against my judgment we decided to ignore the sign and head for the waterfall. The condition being that if anything changed slightly we’d turn back. My primary reasons for not going were pretty simple. 1.) The weather can change rapidly and we’ve already seen that. 2.) We don’t really know why the road was closed. The assumption is that it isn’t passable due to snow but it could be anything. 3.) We’re not prepared for enduring the harsh wind/cold if the SUV breaks down. BUT, the group decided against this and off we went. The gravel road was quite nice as we drove at a steady 30 mph and we were relieved that their wasn’t massive snow piles preventing our journey out to dettifoss. 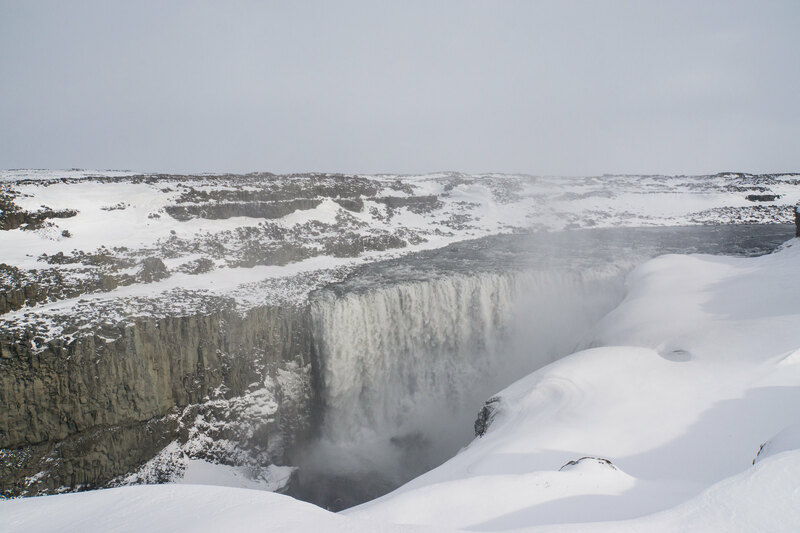 The weather had also resided to small flurries and the anticipation of viewing dettifoss was growing. That is, until our car hit what felt like a massively large speed bump. I mean, Aaron and I were sitting in the back of the suv and nearly went airborne as our lower backs took the impact. A bit of an exaggeration but the first thought through my mind was a blown tire. What had happened? I have no better way to describe the road other than to say we ran over a pavement crevasse. A seperation in the pavement by about a foot or so. Our suv had hit the other side, a rather sharp abrupt edge of the road and miraculously we didn’t blow a tire. I got out in the now heavy winds to figure out how we’d get back across and discovered that the “crash” had ripped out all the rubber/plastic underneath the wheel wells of the car. 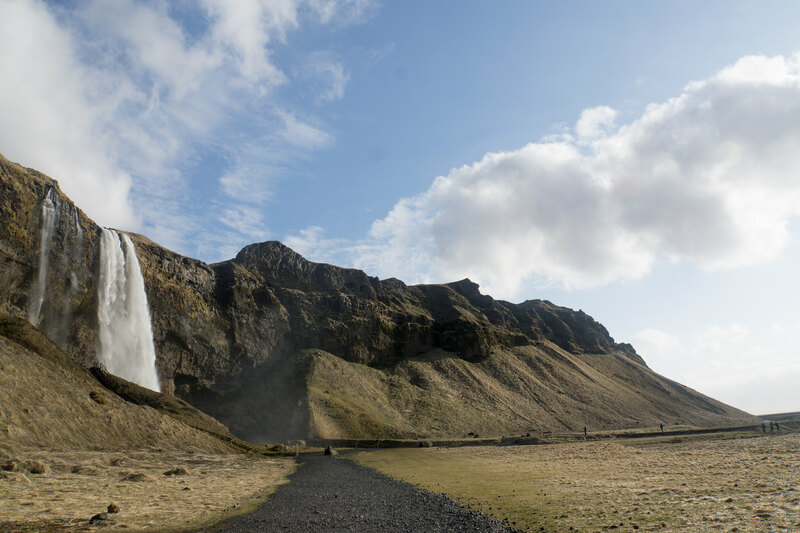 Glad we got all the types of vehicle insurance for iceland! Packing down a bit of snow and slowing proceeding over the crevasse went pretty well and we were back on track, shaken up but back on track. Back on the road we found the official way to Dettifoss. Yes, that’s right. We got the roads confused and should’ve never been on the closed gravel road. Dumbasses. We made it out to the park via a very nice, wide, newly paved road and trekked for about 1 mile (or less) to Dettifoss in the snow. What a cool site. 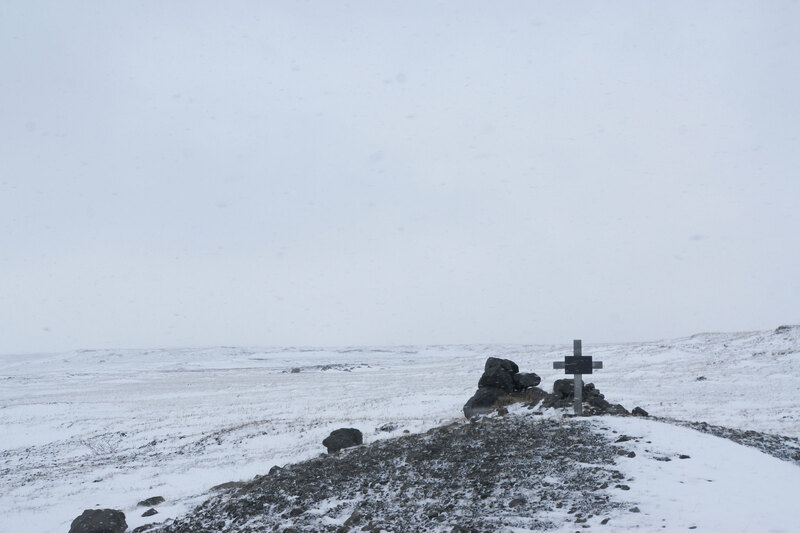 We arrived at the nearest town, Mytvan, and the weather had picked up intensity. Heavy winds, lots of snow and ice, and dropping temps. Due to this we got a hotel in the city which Nathan had already been anticipating to stay at due to a back injury previous to our trip. Originally, the plan was for Nathan to drop us off at a trailhead while we hiked 24ish miles along a canyon, he would stay the night at the hotel, and pick us up the following day at the terminus. But, with the weather and the ranger previously discouraging the adventure we decided not to. Along the way to Mytvan we stopped multiple times for the mudpots and steam vents which were very cool to see. Stopping atop a hill overlooking a cabin and tons of steam coming from the earth a guy rolled up in an older land rover (a common rental for the area). He stepped out wearing tight jeans, a flannel shirt, thick rimmed wooden glasses and immediately we looked at each other and said “He’s probably from San Francisco”. In the first moments of our conversation what did we find out? Yep, an SF hipster! Actually didn’t live that far from me. So after abandoning the idea of a camping/hiking trip we got some pizza/beer at the hotel and called it a night. Woke up to a very cold morning and wandered over to have some breakfast at the hotel “Lobby”. Coffee machine broke twice during our breakfast but everyone got their cup of joe. Always looking a few days out in advance as to what we’d do a whale trip was on the agenda although it was cancelled due to weather and the ships wouldn’t be running. Bummer. On our way out of town we looked up at a the rim of a huge crater formation which we were planning on seeing but the road was just too rough to get out there. We essentially needed a land rover or something with much more clearance than our Volvo SUV. Onwards our goal was Dimmuborgin to see the lava formations. Talk about cool! Exiting Dimmuborgin our goal for the day was a guesthouse in Akureyri (Capital of the North). During the trip we found ourselves going over a mountain pass in nearly zero visibility due to snow. It’s a good thing they have 5ft tall bright yellow posts staked every 15ft or so or else we would’ve had to wait out the storm. I’ve definitely never been in such conditions before. Pretty nerve wracking to say the least. 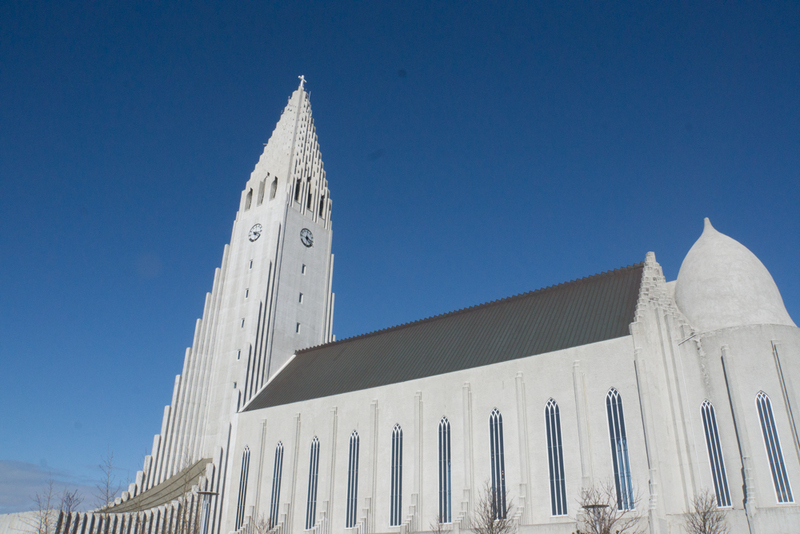 We arrived in Akureyri which is the 2nd largest city in Iceland with nearly 18,000 people. Pretty large with a number of restaurants and bars. Once again we had to call the landlord to get into the guesthouse, if you visit, make sure to have a cell with an international plan can’t stress that enough! Steve and I went out to the nearby bowling alley to grab a beer while Aaron and Nathan stayed back at the hotel. There was a solid turnout at the alley and without a reservation Steve and I decided to grab a beer and shoot some pool overlooking the bowling alley on the 2nd floor. Was a good was to round out the night and look back on the trip thus far. Back at the guesthouse we chilled out and had a few beers while watching some rather odd icelandic cartoons. Flying out of Denver I would be meeting up with Aaron and Nathan in Boston en-route to Keflavik International Airport one day prior to Steve’s arrival. The process of getting through customs in Boston couldn’t have been easier. Once I arrived at my gate I quickly found Nathan who had already gotten a table at a nearby restaurant, which had a considerable line, so I jumped the barrier and joined him for a much needed burger and beer. Aaron arrived soon afterwards and we boarded the plane to KEF, so exciting! We arrived in KEF, hoped on a shuttle and without too much effort and found our guesthouse near a major strip on the town. 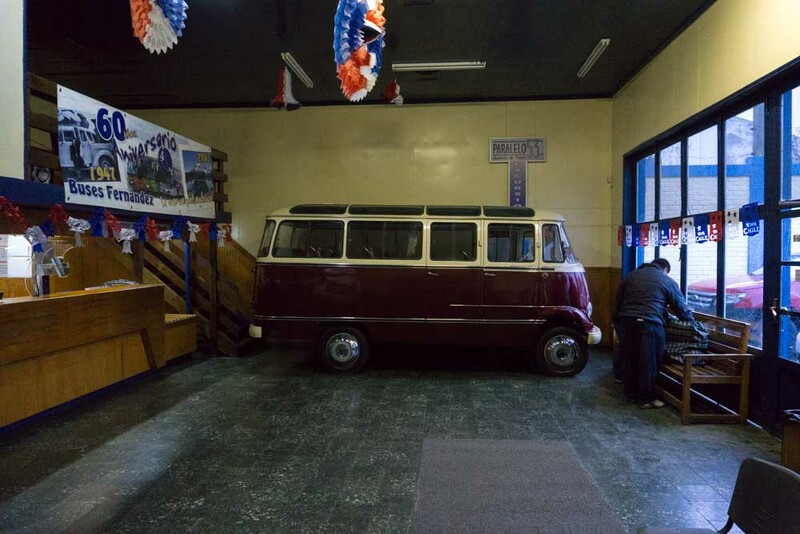 Problem was, the doors were locked and there was no attendant there. We checked the email and checkin wasn’t until 3pm…. it was 9am. Bummer. Even more of a bummer was that each of us had about 50lbs of luggage. Without many options we decided to find a breakfast spot and came across Reykjavik Roasters, a goldmine of fantastic coffee. They didn’t mind us hauling in our luggage and chilling out while we sipped on a nice pour-over coffee and ate what we’d later find to be a traditional breakfast of bread, cheese, jam, and butter. 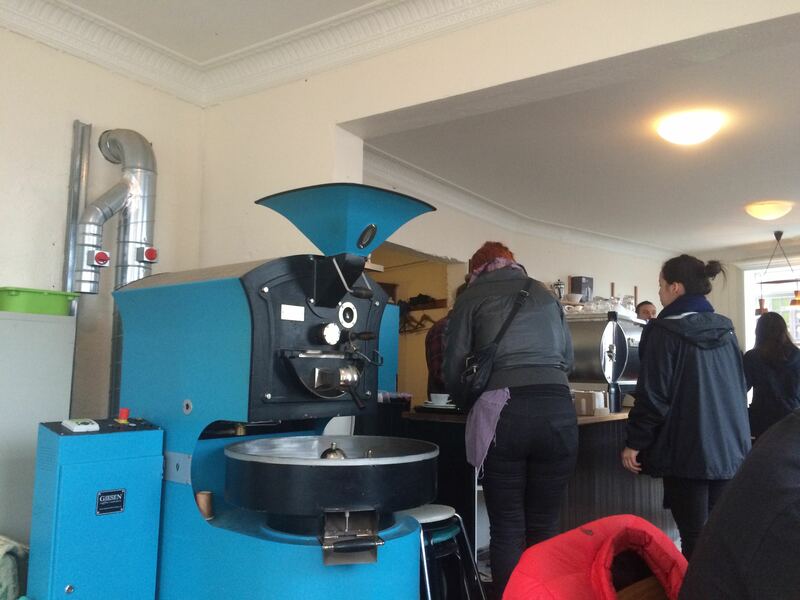 Reykjavik Roasters. These guys know what their doing! Now that we were all 50lbs lighter it was time to checkout the town, exciting! We went immediately to the shore, a vista point for some mountains far away, and then walked towards the town square following the coastline. A large glass building was visible from a distance so we figured it was something to check out. We didn’t get any video of the building but imagine each glass panel in the picture being illuminated in various patterns. It was quite the spectacle at night. We followed up the rest of the afternoon with pizza, viking beer (haha, it’s just the coors beer of iceland :-)), and wondering about the town plaza. At this point Aaron, Nathan, and myself hadn’t had much sleep so we all went back for a power-nap to recharge before dinner. While stumbling around the streets in search of a good dinner we came across “Restaurant 73” which had the best burger I’ve had to date. Hands down, nothing is going to top that for a loooooong time. It’s hard to describe why it was so good. I had the others try it to see if they could pin-point it but we came to conclusion that it was due to the minimal processing of the beef as compared to the US. If you’re a fan of burgers this place is a must. The others got a seafood which was just as impressive and on the way back we came across some live music to cap off the night. 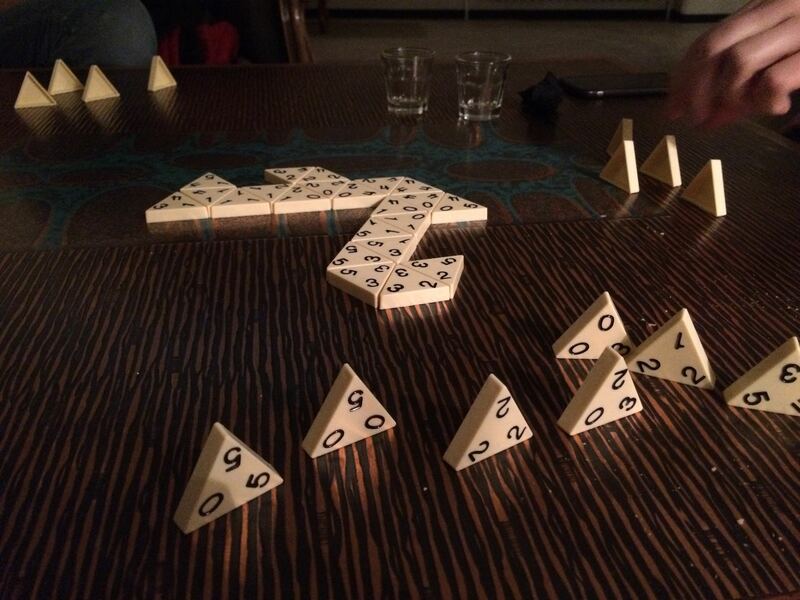 While sipping on brennivín we shuffled through a stack of board games and choose to play Triominos which turned out to be nearly the worst game I’ve ever played. If you enjoy keeping track of numbers, a lot of numbers, this game is for you! the worst game ever invented, triominos. Today, Steve would show up with our chariot which would fuel our adventure throughout the remainder of the trip, all 830+ miles! It wasn’t clear on what rental vehicle we’d be getting so there was some anxiety in terms of cargo space. Would we have to sit with luggage on our laps for 2 weeks or have room to sprawl out? Today was also blue lagoon day! It’s quite the tourist destination but with it being the offseason we were optimistic. It didn’t feel as though night ever came around. We went to sleep in light and woke up in light. This would take a slight toll on myself as the trip would go on but with slightly over 18hrs of daylight a day it can be somewhat challenging to see true night sky. Once again we kicked off the day at Reykjavik Roasters and Steve showed up soon after we finished breakfast. It was off to checkout the local museum to get a glimpse of what we’d be experiencing over the next two weeks. The next stop on the list was the towns church which is a work of art. Simply impressive! It was closed so we put it on the agenda for later and went across the street to Cafe Loki for meat soup (traditional plate) coupled with coffee. Quite an odd combination I must say. Okay, so that’s enough for town activities. 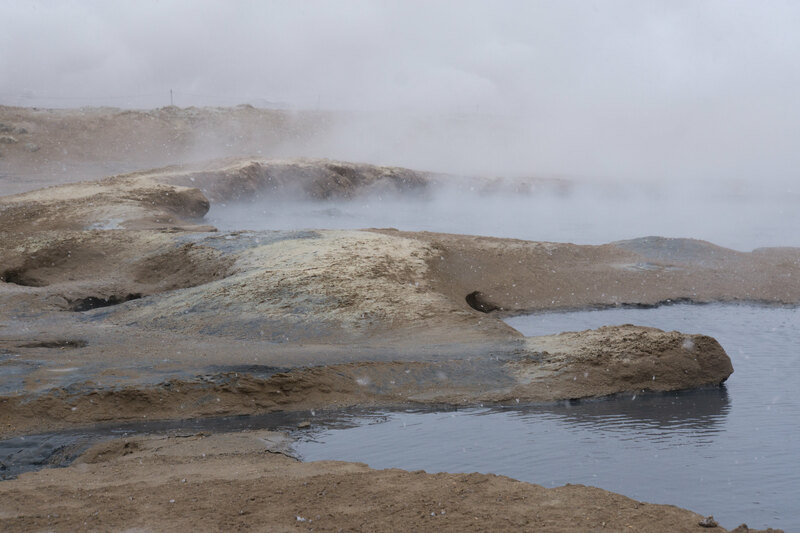 We headed back to get the SUV which turned out to have just enough room for all of our luggage (Volvo XC60) and headed to the blue lagoon where we closed down the place…haha. 4.5 hours in a hot spring with accompanying bar and silica face mask stuff. The latter not being my cup of tea but when in rome 🙂 To close out the night our mission was to eat at the Lebowski restaurant but as it turns out they stopped served food just minutes after we arrived! Today was Golden Circle drive day! Geyser’s, waterfalls, and the Þingvellir National Park were on the agenda for today. the golden circle drive. We did this with a bit of campsite searching. After checking out of the hotel we jumped in the car and planned on stopping at the Þingvellir national park entrance to gather some information on camping later that night. 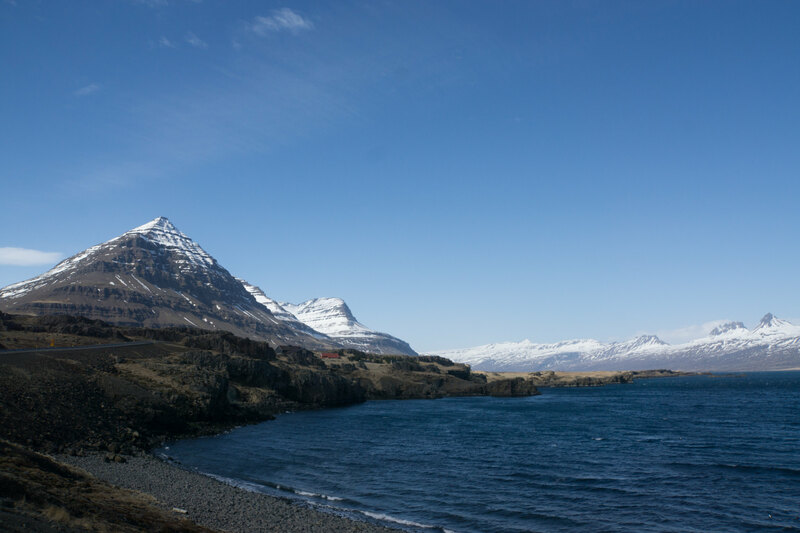 With the parks entrance being the first stop along the golden circle it meant that it was also our last stop. The weather around Þingvellir wasn’t all that great, quite cold, overcast, rainy, and the winds were picking up as we got there. I could sense some hesitation in the group and after talking to the ranger there was some camping open but everyone was pretty much against camping in under those conditions. But hey, we had the whole day of exploring ahead of us and who knows, it could clear up. 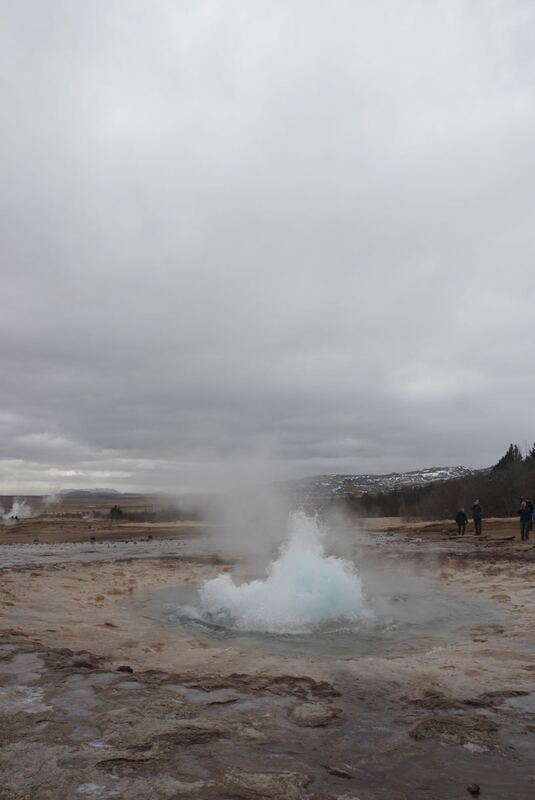 So we continued to gather info and went on our way to checkout Geysir. 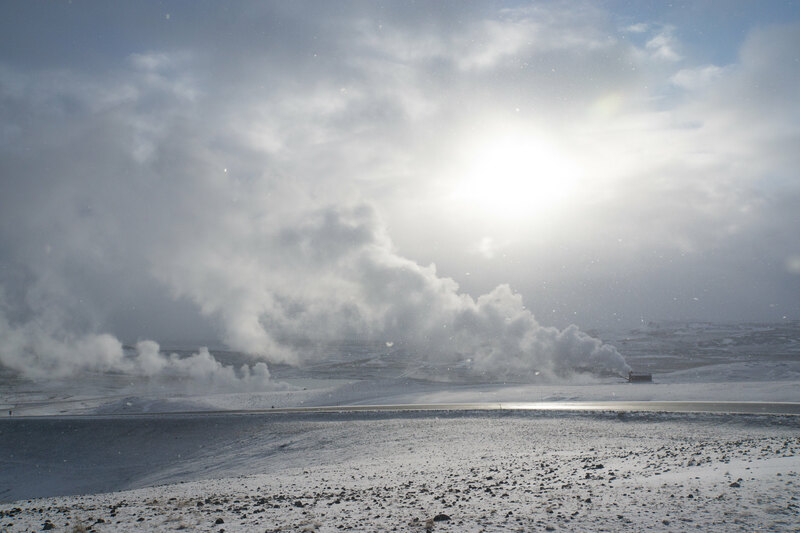 Geysir, is quite a popular tourist destination right off the road where the geyser blows about every 15mins. Even with it being the offseason there was quite a crowd. While stopping in at the gift shop I ran into a guy with one of the icelandic trucks we’ve been seeing so much of. His english wasn’t the best but we chatted about the rig setup and went about our ways. All the trucks pretty much run Dana 60’s standard or rockwells in some more extreme cases. Most of them are bagged with heating systems for the fuel lines. Other than those points not much else is modified on the rig which I found strange considering their running 44-54″ tires. Must go through brakes weekly. Even the Cherokee’s are modified! all the trucks are modified. Even uni-bodies. Next up on the agenda, Gullfoss waterfall! Our first big waterfall and it was truly epic. The pictures don’t do it the slight bit of justice. Part of the trail was closed off due to snow so we didn’t go down to the base which was a slight bummer. All in all it was a very cool attraction which we stayed at for probably too long 🙂 Moving on we stopped at random sites to take in the scenery and came across some iceland horses which came over to greet us. While petting them Steve got his thumb moderately bitten by one of them. No ER trip required but it looked like a pretty solid bite! With it getting later in the day we headed back to Þingvellir in hopes that the weather cleared up since it was so bright and sunny around the rest of the golden circle. NOPE, if anything it had gotten worse. At this point we concluded that Þingvellir just creates it’s own weather system. We then decided to hit the road again and find a better campsite, with a primitive map in hand we stopped at one which was a playground in someone’s backyard. That wasn’t too appealing so we headed onwards. Couldn’t find one phantom campsite and came across another which was closed. By now it was getting late(ish) and we decided to pick a spot along a river which we had driven across early. It was the first time camping for Steve and Nathan and both enjoyed the night along the river. At round 12:30/1am that night, sound asleep, Steve started shouting in glory for us to wake up. 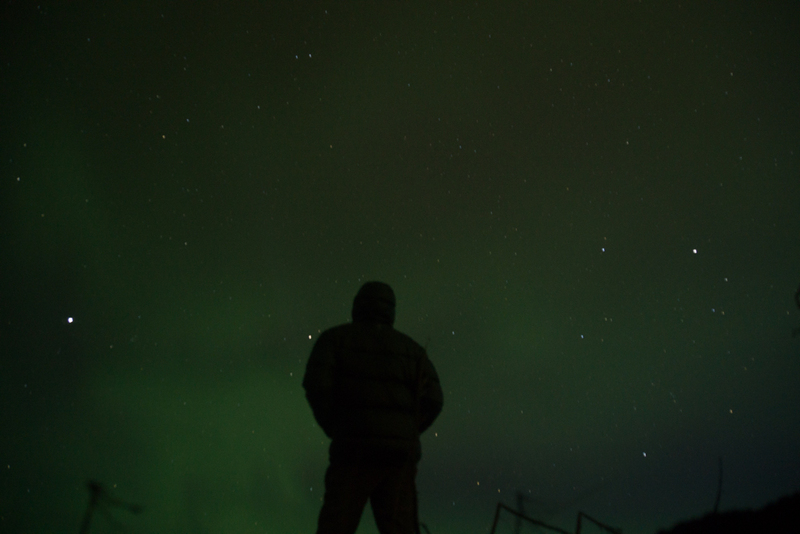 I’m a pretty heavy sleeper so I really didn’t hear him at first but it finally registered that he was up and the Aurora Borealis was visible. I got up and spent the next 45 mins or so taking pictures in awe of the night sky. The excitement was so much that I really didn’t even feel the cold breeze, it was just epic in all definitions of the word. Iceland, where do I start? 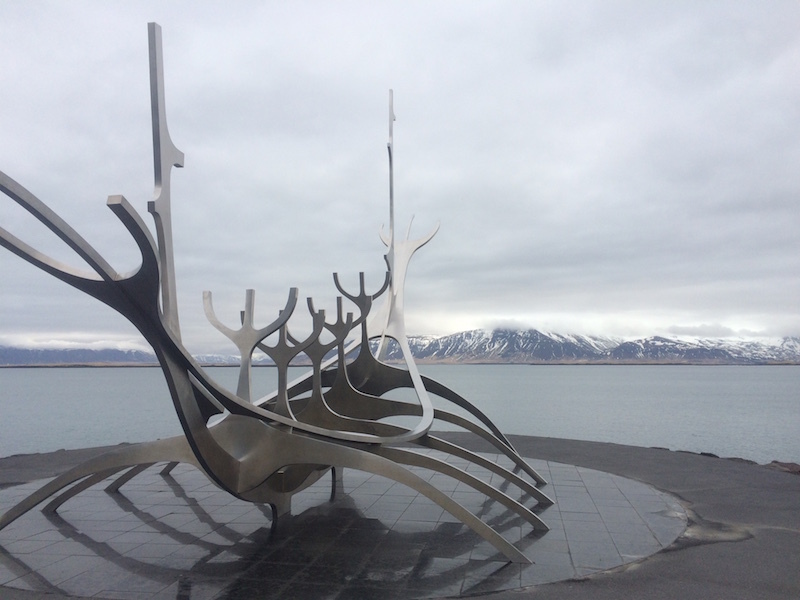 Standing on the Reykjavik coastline the wind was at a constant force, overlooking a modern stainless steel sculpture of a viking ship, we realized that it was happening. 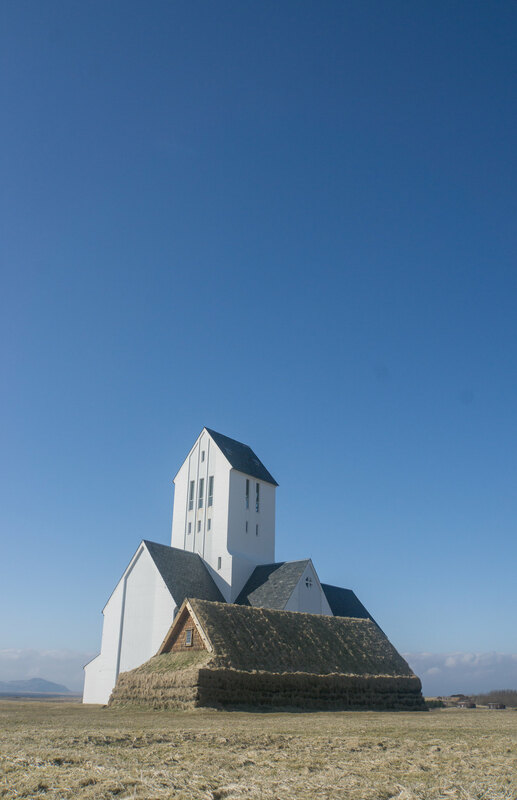 Iceland was happening! A few steps forward and we were standing on the soft icelandic moss, engulfed in the cool crisp breeze, content for a moment as we wondered how the next two weeks would unfold. The trip had begun as part sightseeing/part backpacking but once we delved into the details and called around it was apparent that their would be no backpacking due to weather, park restrictions, and accessibility. 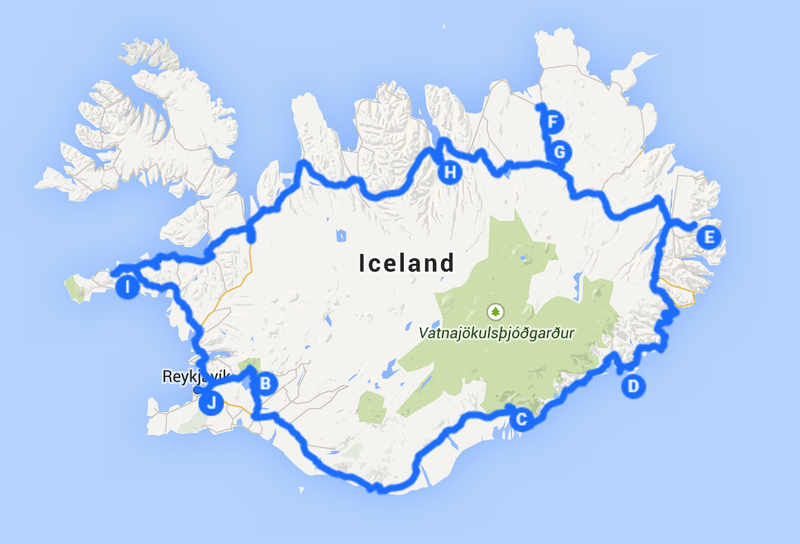 With a multitude of attractions to discuss and countless regions to describe I’ll be breaking our trip around “Ring Road” down into four segments going counter-clockwise around the country as well as a post for the Vestmannaeyjar (westman) islands which we took a ferry to, stayed a night, met some people that knew a friend of mine, and held a puffin there. Since getting into mountaineering, ice climbing has always been this far off dream of mine to someday attempt. The desire probably stems from the media showing elite athletes ascending vertical ice en route to the summit, something which seems nearly impossible from the outside. 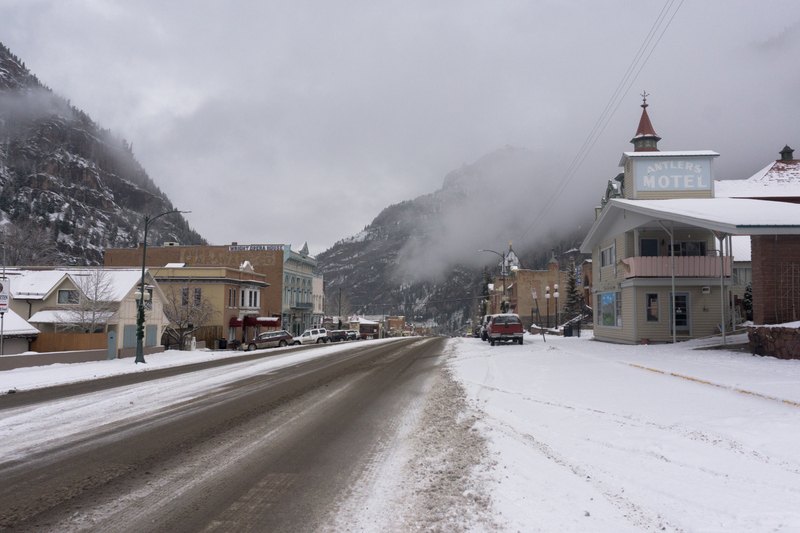 Ouray, CO is known for some of the best man made ice in the world which brings us to IceFest 2015!!! That’s right, three exclamation marks! The Ouray Ice Park is not only a recreational ice climbing venue but also an engineering effort, combining natural and manmade elements. In addition to the hard work of many dedicated people, the world-renowned Ouray Ice Park exists thanks to an overflow of excess water from the City of Ouray’s spring-fed supply tank; a clever layout of irrigation pipe; more than a hundred garden-variety shower heads; a little knowledge of fluid mechanics; and the perfectly located deep, shady, and cold Uncompahgre Gorge. Onto the trip! Adam had got an uber and picked me up en route to the airport. Uber (and other similar services) are the future of taxis. And I think my parents would agree after spending a week in the city in the summer of 2014, using uber as a primary means to get around the city. Basically, the idea is that the customer creates an account with the company and when a taxi is needed they request one via a smartphone app. Upfront one is able to see the cost of the trip, talk to the driver, text the driver, choose to make it a carpool and cut the cost, etc … More features are being added monthly it seems. The drivers then show up in their own car or a newly bought ones which a group of uber employees might have went in on. At the end of the trip no physical cash is exchanged, a bill is sent to the credit card on file and that’s it! The drivers are all very friendly and the vehicle fleet ranges from Honda’s to Land Rovers. The driver seemed somewhat in awe of meeting people that did “extreme” sports. I had to chuckle to myself thinking that this is how I go out in life… this is what ends it…. should’ve just got a one-way ticket to Denver and saved a few bucks. At this point I really had no idea of what I was getting myself into but supposedly the IceFest is one of the safest environments to give one of the most extreme sports a try. After a good discussion with the driver she dropped us off at the airport while Adam was still on his work conference call… silicon valley… you’re killing me, and others. On the plane Adam and I were split up but something rather hilarious was happening in the front of the plane by Adam. An older veteran sporting a cane was trying to buy the girls around Adam drinks during the flight and they weren’t having it so he gave up and proceeded to buy Adam three drinks over the course of our 2.5 hour flight. Hold tight, this is also relevant later on 🙂 After picking up our checked bags we headed straight for some chip/salsa and a beer as we waiting on Cathy to deplane. With not a single lost bag and all flights on time, Henry, which lives in Denver, came by to pick us up and head out to drop gear off at his house as well as grab some dinner. While chilling at Henry’s house I got to see the new Lytro Professional camera (Cathy, works for Lytro) which is quite badass I’ve gotta say. It’s frickin’ gigantic but pretty sweet. I swear someone could retrofit the lens “barrel” with a surface-to-air missile launcher. Would be interesting to see their take on a long-range lens 🙂 That said, I can’t wait to see how their technology progresses. Chillin’ at Henry’s and checking out the Lytro camera. While at dinner most of the burning man crowd from 2014 joined us, Jordan, Tiffany, and Gavin which was awesome. Felt like a mini-reunion. Had a fantastic burger and then it was time to hit the road for a 5.5/6 hour drive to Ouray, CO. Luckily Henry and Ali switched off driving through the night so the slackers in the back, us, got some sleep. Well, as much sleep as one can get in the back of a car. We arrived in Ouray with impeccable timing, about 2hrs before the event started. It was time to load up on some food and get a prime spot at the gear outposts to ensure that we were able to get ice axes (called tools) and crampons (those spiky things on peoples boots). Thats right, virtually no sleep and definitely no sleep for the drivers, straight to climbing we go! It’s not uncommon for the gear suppliers to run out of demo gear so getting a prime spot is of utmost importance and everyone was well prepared for this mad rush with no sleep. I’m the newbie in this crowd of IceFest goers. After grabbing the gear we set out to start climbing. With the park essentially being a series of ravines you are starting at the top where the anchors will be fixed then rappelling down the wall to where you’ll be spending most of the day climbing. Since I have a phobia of heights and rappelling off an unexplored ridge scares me to death I decided to hike down to the bottom floor, takes longer but my nerves are at ease. For a description of what Ice Climbing is I’ll turn you to wikipedia. For a quick comparison. On the left is a traditional ice axe used for mountaineering and on the right are the tools used for ice climbing. The climbing was unreal. I don’t do much traditional climbing as it is but ice was frickin’ awesome. In traditional rock climbing the rock formations dictate where your hands/feet can be placed whereas in Ice you can almost cling to whatever you want given the tools being used. I felt like spiderman clinging to the wall moving freely as I wished. In the few routes I did a few things did interfere with tool placement. One being concave formations, they would just shatter when hit with the tool, no bueno. And the other being icicles or overhangs which don’t provide any placement for the feet. I’m sure with fitness those are doable but not in my current condition 🙂 Overall it was a lot of fun and not as physically exhausting as I thought it might be. Don’t get me wrong, it’s hard, but I was anticipating only making it up a few feet and back down. Goal exceeded! Making my way to the top! Logistically the next day was a bit easier since we just had to roll out of bed somewhat early and get up to the park before the crowd hit. Saturday is the big day which draws in the greater majority of people so it was in our best interest to get there before it opened. With gear in hand I started migrating to the cliffs and came across Jarrel and a huge plastic purple tub. Come to find out Jarrel was making breakfast for everyone and that he’d be hauling this mega-sized tub over-shoulder up the snowy trail and to the top of the canyon. Now that’s strength. Jarell making breakfast for the group. We got a lot of mixed reactions from groups walking by. We set out for the bars that night and was planning on going to the Petzl party but after arriving and it looking like a high school prom, wait … what? … yes it was prom themed for some reason which we couldn’t comprehend. I mean this is a sport of mostly guys, mostly. And they decided to have a prom theme? We quickly ditched the idea of paying the $15 entry fee and headed out to the RedBull sound truck where we created our own party. Rouge burning man street style 🙂 The Redbull guys cranked up the sound for us until the cops came around to put a damper on our fun. While making a ruckus some dudes with professional cameras were snappin’ pictures, I sorta feel we’ll end up in Rock&Ice magazine or something similar. See ya next year Ouray! On the flight back Adam and I were waiting in the airport to run across, no other than, our veteran friend from the flight out. At this point he was well into a lot of drinking and after a lot of back-n-forth with airport security they decided that he was too inebriated to board the plane. They got him some tickets for the next morning and we walked over to board the plane. Great friends, awesome weather, and good times! From the very beginning Penguins were a primary attraction and something I had wanted to see. Most penguins in the region are located in Ushuaia, at least that’s where the greater majority of the tours go, and in looking at it there was no way to get there and back given my short time in Patagonia. According to others it takes roughly two days to get from Puerto Natalas to Ushuaia (one-way) due to the buses not syncing up. Bummer. Towards the end up the trip I mentioned an interest in seeing Penguins while at Erratic Rock and was told to checkout a Hostel in Punta Arenas that runs King Penguin tours out to Tierra Del Fuego. Which is much closer and doable in a day, a long day! 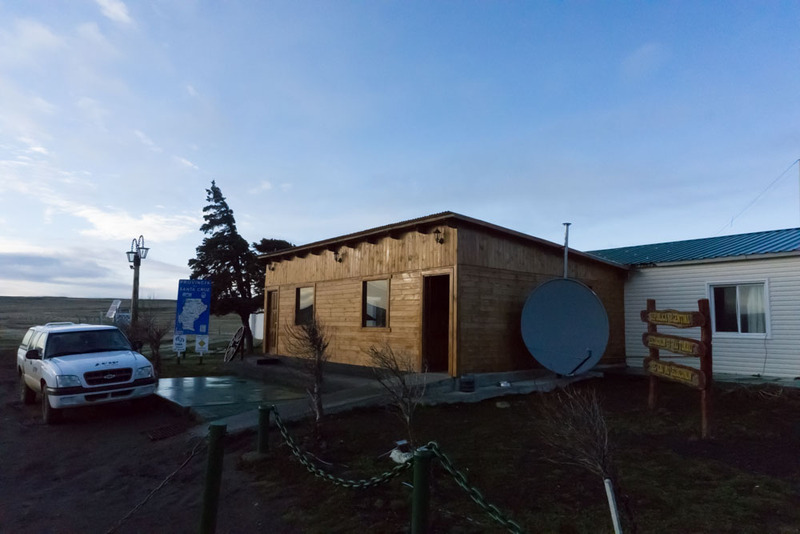 I arranged to head out to Punta Arenas a day early and booked a room at Hospedaje Magallanes – Bed & Breakfast as well as a tour out to see the Penguins on the following day. Score! 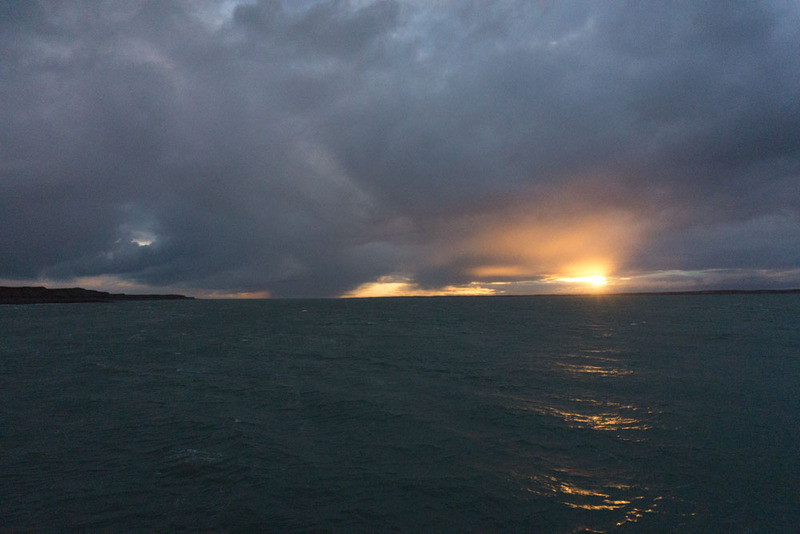 I said my goodbyes to the great people at Erratic Rock and hoped on a Bus en route to Punta Arenas which would arrive mid-day, giving me plenty of time to walk around the city before nightfall. I checked out the city ‘lookout’ which was under construction and then meandered through the city of approximately 120,000 people. 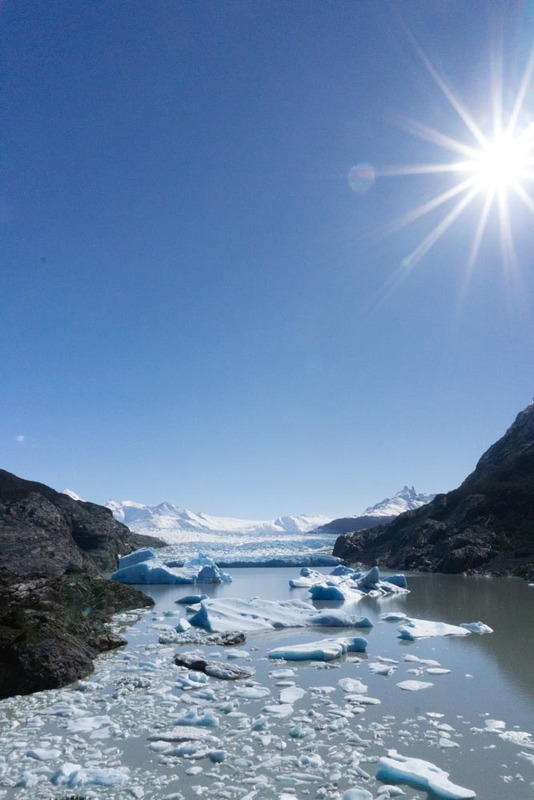 A few highlights would be the port for Antarctica, tons of concrete sculptures and street art, colorful buildings, and a spectacular cafe on the beach facing Antarctica. I ended the night at Hospedaje Magallanes conversing with people from Germany, Denmark, Austria, and Colorado. Twas a pretty great time! Woke up bright and early the next day to hop on-board a shuttle which would take us to Tierra Del Fugo. The travel there was just as much fun as the end goal of seeing Penguins. 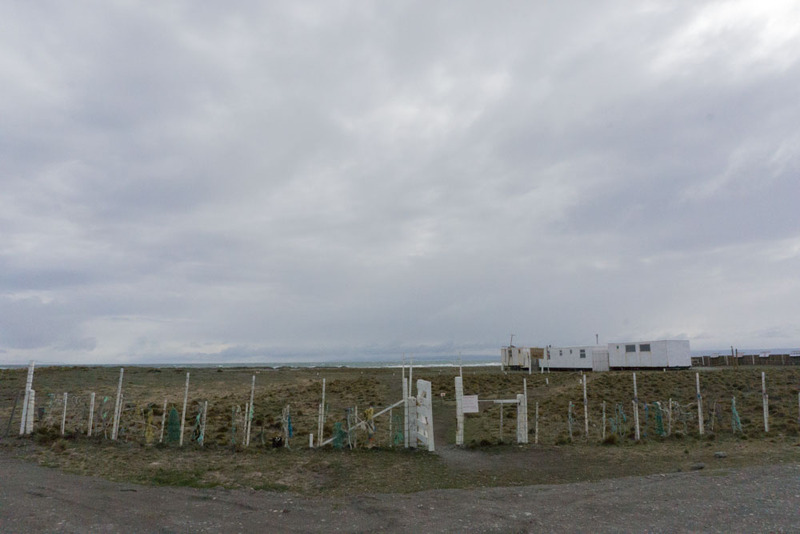 After a 30-45min drive we drove onto a cargo ship which would transport us across the Strait of Magellan then continue through Porvenir and onto Tierra Del Fugo. 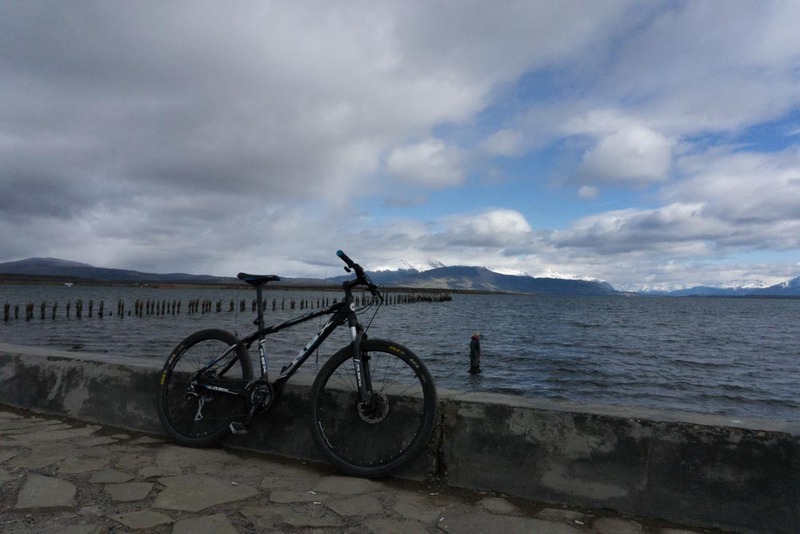 Out transport across the Strait of Magellan! After arriving in Porvenir we stopped at a monument giving respect to the Selk’ Nam people which arrived to the area 11,000 years ago. We then continued to the center of the city for a quick lunch and a visit to the local museum. So far this day trip has greatly exceeded all my expectations. They’ve really got it down! After another 5 hours of driving we arrived at Parque Pinguino Rey! Headed into the trailer to meet the ranger of the park and pay our dues as well as go over a few rules for the area. It was time to see the King Penguins! Researchers think they migrated about 7 years ago and it was only 3.5 years ago that this colony was still unknown to the general public. Talk about large, wow. I’d say there a good 3-3 1/2 ft tall and are as hilarious as I imagined they’d be. It was mating season so the whole pack stayed on the other side of the river creating a 30ft barrier or so. As graceful as they are in the water they sure are awkward on land. Saw one trip and fall face first and two get into a fight… ferocious. At this point I was really wishing the kit lens had a tad more zoom but oh well. The guide said during summer they come across the river and provided that they’re not scared off you’re able to stand next to them, touch, hug, etc… They ask that you get eye level with them and let them come to you. 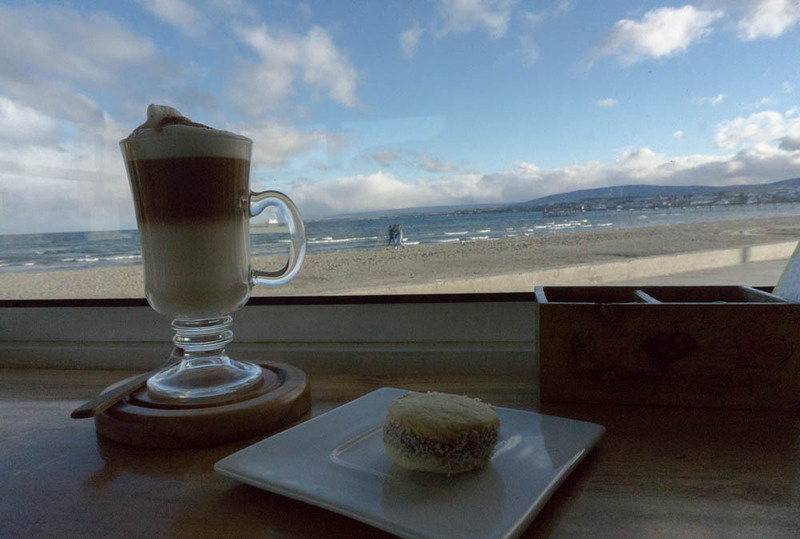 After a visit to the park we jumped back in the van en route to Punta Arenas with a brief stop in Cerro Sombrero for snacks. After taking a chill day and walking around Puerto Natalas checking out the street art, sculptures, and stores I decided to visit the Cueva Del Milidon prehistoric caves. The caves were home to a giant ground sloth called the Mylodon which died 10,200 – 13,560 years ago. There’s a tour which runs out to the caves but only allows tourists 1hr to walk into the natural monument to visit the main cave and doesn’t allow for the other two to be seen. I decided to rent a mountain bike and spend the day out there exploring all I could. Starting the 16km trip to the caves (32km round-trip). Such a nice day! The bike was a bit small for myself but it worked and would allow me to take as much time as I wanted once at the park. Generally I only stick to mountain biking in the woods, road biking has never been too appealing and this trip sure did reinforce that. I really don’t see how people find enjoyment riding on flat predictable pavement at least the scenery here was amazing. AND, the winds kept me on point. After 10km on the highway a gravel, rutted, two-way road continues for 6km to the caves where a bit of elevation is gained. After a short while on the gravel road the rain started to pickup, nothing too heavy but just enough to be annoying. At one point during the ride, on the gravel, the wind blew me down into the ditch and I’m glad I had the mountain bikers reaction to keep the momentum up and pull through and out of the ditch. Good times. It was also a lesson in making sure what side of the road I should be traveling on, wouldn’t want to get blown into a car. 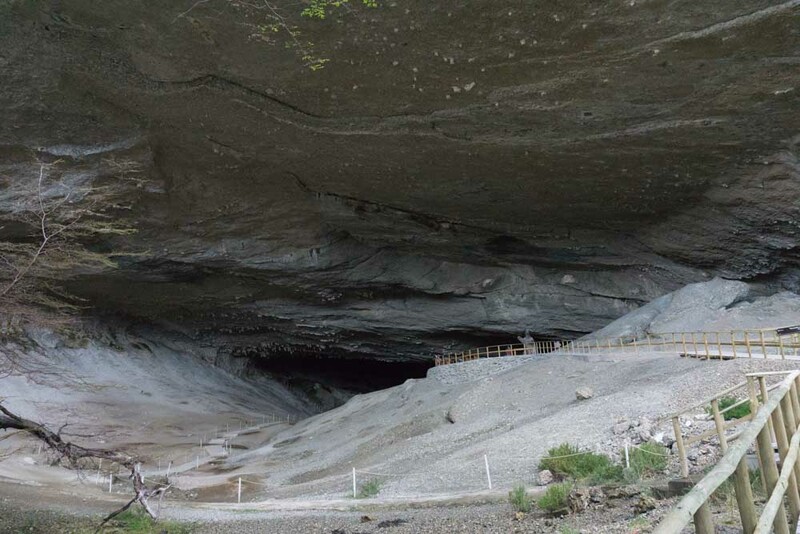 I arrived at the Cueva Del Milidon Natural Monument around noon which gave me a considerable amount of time to see all three caves. There was a lot of modern infrastructure leading up to the main cave which reminded me a lot of Yosemite, the other two require hiking 2-4 miles out for each one. You can checkout more pictures in the link below but the other two caves were not anything too special. The hike out to them was more rewarding than anything. On the ride back I got a flat tire along the dirt road and with no spare, repair-kit, or pump I ended up hitching a ride with a Chilean family whom had been at the park for the better part of the day. It was a lot of fun. Along with my limited vocabulary and the help of Google translate I arrived back to the hostel with a fair bit of daylight left and gave slack-lining a try…. wow is that hard. After returning from hiking in Torres Del Paine I found out that I’d have to reconsider the possibility of getting a bus to El Chalten due to a strike that had recently started for buses crossing into Argentina. 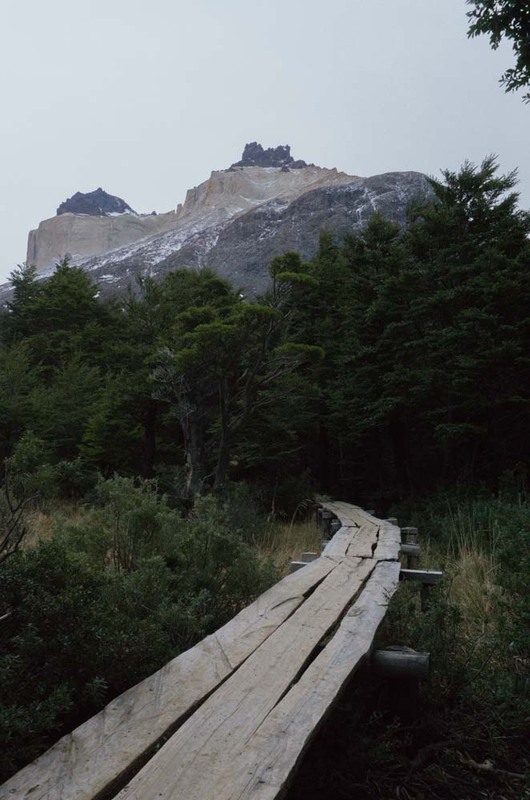 Originally I was going to hike Torres Del Paine then continue hiking near Mt. Fitz Roy in El Chalten. I guess every year around this time, Chile’s independence day, a number of the bus companies go on strike and transportation across the border can be questionable unless you have your own car. The one thing that can be guaranteed is that if the bus is running that day it’ll continue running throughout the day. 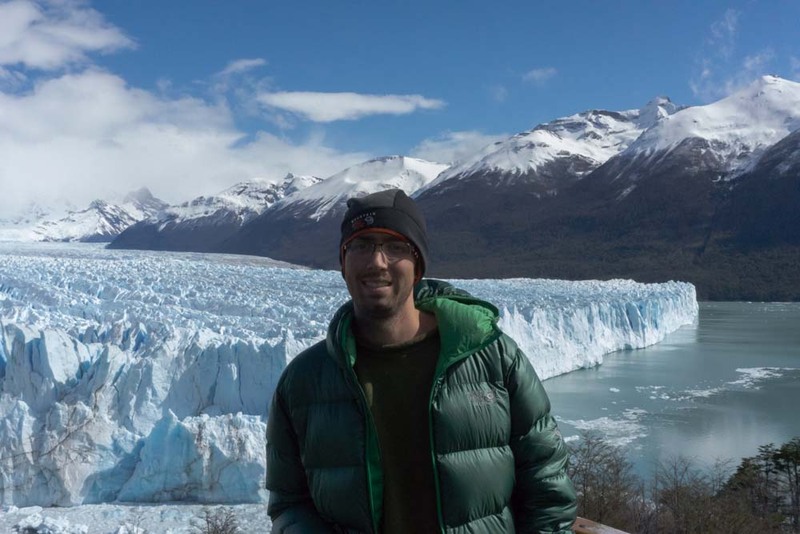 With that in mind I planned a day trip to the Perito Moreno Glacier which is one of 48 glaciers making up the Southern Patagonian Ice Field (3rd largest in the world). In Puerto Natalas I got a bus ticket to visit the glacier from a company by the name of “Compa”. Was a bit rough going since they didn’t speak English but I walked out with a ticket for the following day. In retrospect I should’ve gone with the company, GO, which had much much nicer buses. Compa basically just had touring vans. Not a big deal but something to take note of. They showed up at 6:30am the following day and after a quick paperwork check I was off. At the Chile/Argentina border. This was the Argentinian outpost, I forgot to get a pic of the Chilean one. Most of the paperwork was in order, most of it that is. Arriving at the Chilean border control the officer was looking for a mysterious receipt which had a stamp on it declaring when I had arrived to Chile and where I had entered from. This was something I couldn’t provided and after a 20 minute discussion, using another guide as a translator, he let us pass and from there on it wasn’t an issue. I would later find this tiny receipt buried in my luggage. From the border we drove for about 4 hours to El Calafate then another 1 hour out to the glacier. The tour was divided up into two parts. For the 1st hour we walked around a very elaborate set of walkways to a visa overlooking the Perito Moreno glacier in all of its glory. Damn is it huge, and it’s just one of 48 in this ice mass! 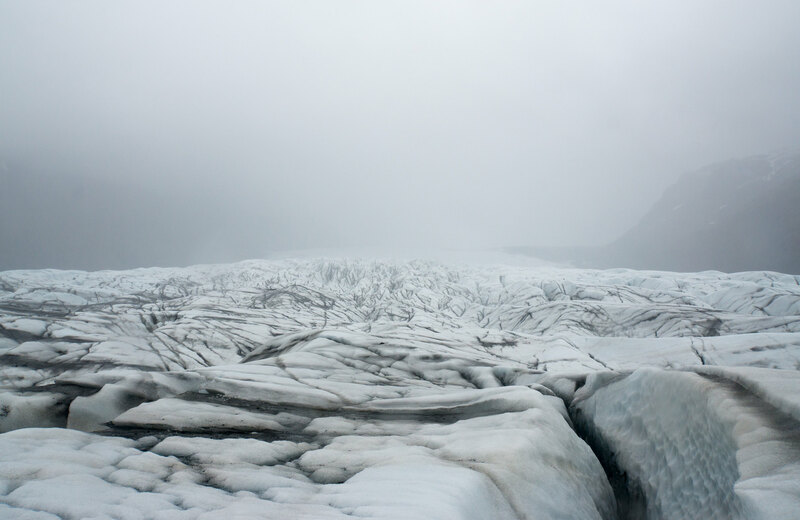 The glacier is living, meaning that, you can see chunks of it falling off into water. If you’re interested do some reading up on it, the mass is constantly growing and residing from the shore causing the constant ruptures. After the vista tour on land we took a short drive to a dock to board a boat which would take us out 200 meters from the glacier. 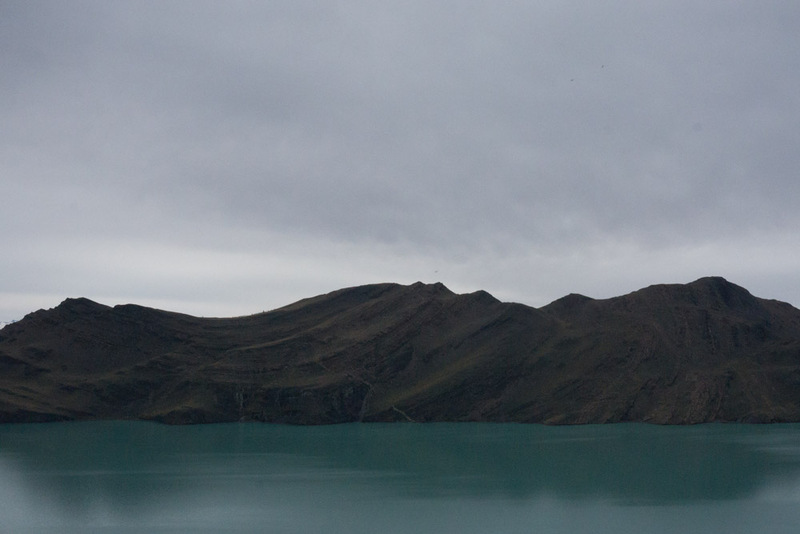 This is the first of four posts that I’ll be making to cover my trip to Patagonia. I’ll be updating this post at a later date with a link to gear and preparation considerations that I made while planning. A link to pictures of the trip is at the bottom. It’s been over a decade since I’ve traveled outside of the U.S so I sent in the paperwork for a new passport and a visa to Argentina. Once both of those arrived and my work vacation was approved it was time to fork over the cash for what would be a adventure in itself just to get down to southern Patagonia. From my doorstep in San Francisco to the time I arrived at a hostel, Erratic Rock, in Puerto Natalas I had racked up 41 hours, ouch! The route being San Francisco -> Miami -> Santiago -> Puerto Montt -> Punta Arenas and then a 2.5/3 hour bus to Puerto Natalas. Not to mention that due to airline switches I had to re-check my baggage in Miami as well as Santiago which was a huge pain. I arrived in Punta Arenas and contrary to what you may read online, tickets for the bus companies are not sold at the airport. If you happen to have a ticket, purchased online or by some other means, the bus companies make a last stop at the airport but in no way can you purchase a ticket there. So I got a cab into the city, Punta Arenas, and got the last bus out of the city to Puerto Natalas via Bus Fernandez. Pretty glad they have buses running as late as they do. At Bus Fernandez wishing we could take this instead of the super modern, very nice, bus we did. I arrived in Puerto Natalas around 11pm at Paul was still awake when I arrived at Erratic Rock. At this point I was soooo glad to find that not only was there a room available, Paul, as well as most everyone else in the hostel spoke English. Double win! At this point I should probably mention that I didn’t plan anything for this trip other than purchasing a plane ticket. No lodging, No tours, nothing …. figured it would add to the experience and it sure did as you’ll find out shortly. I’ll try to keep it fairly concise. 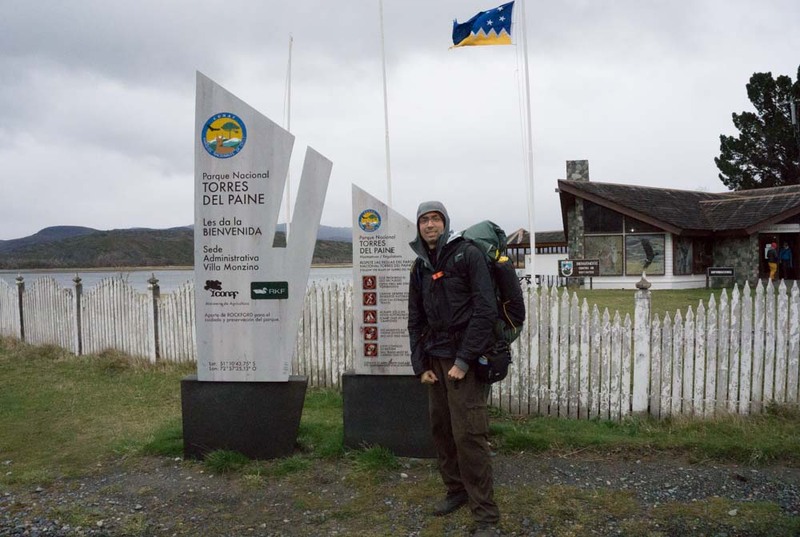 After a day of recuperating from the hellishly long flights I boarded a bus to Torres Del Paine. The weather wasn’t all that great and with it being the off-season, September, it’s what I had expected and prepared for. Let me backtrack for just a bit. Torres Del Paine National Park has one main circuit called the “O” which circles the park as you might imagine. A subsection of the “O” is called the “W” which, as you’ve already guessed, makes the shape of a “W”. People have since added another route called the “Q” which just means that one would hike into the park from a bus stop vs. taking a bus or ferry to a trailhead. Starting the “Q” from the eastern side means adding 3km and started from the far west it adds 18km. Shortly after this was taken the rain started up and would continue for the remainder of the day. Originally I had planned to do the “Q” starting from the western side which is located at the administration office but it turns out the back side of the “O” was closed and only open to guiding companies, lame. For those reading and planning a trip to go just one bit of advice. If the refugios are closed on the backside the trail is as well, I had figured I could camp at the free camps but that’s not the case. I hoped off the bus at the administration office, signed in, paid my dues of $6, and hit the trail with a steady 10mph wind and rain welcoming me. It was windy enough to produce horizontal rain for the entire day across the flat expanse of the trail headed to the park. The primary reason for starting so far away and walking into the park is to view the full range of mountains in their majestic nature. This was masked by the clouds and rain so that wasn’t great, then again what else did I really expect. 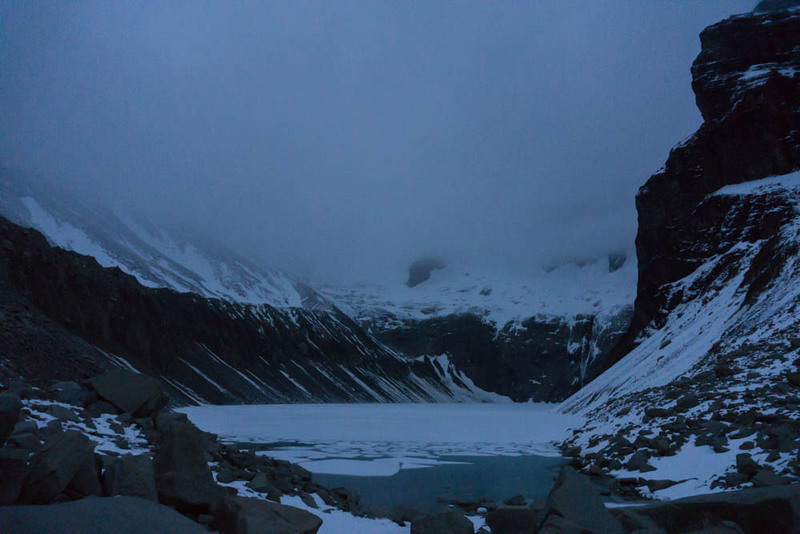 I arrived at Paine Grande and paid $6 to setup camp in the backyard of this refugio. Let me explain the shelter situation in the park since it’s quite different than anything I’ve seen before. There are four types of accommodations/shelter in the park which are 1.) Traditional camping which is not allowed everywhere but it’s free 2.) Refugios which you could think of as a hotel and the ones I saw had some sort of mini-mart/grocery store. Running water, hot food, a bed for a fee. 3.) Camping in the back yard of a Refugio for a highly discounted rate. 4.) Hotels, with a massive price range. From $300 to $3,000 a night you pick! I brought a single walled mountaineering tent along on this trek which has a funky internal frame system. I had tested the setup at home but setting it up in the wind proved to be quite comical to say the least but I got it setup. After organizing things a bit I headed to a small shelter to make dinner and ran into two guys from Poland who had been traveling for 2 months now. Had a nice conversation with them and called it a night. Numerous elevated walkways are scattered about the trail. Woke up to more perfect weather, packed up everything and headed out. After crossing a sweet suspension bridge I arrived at Camp Italiano. This is a free campsite in forest which meant a lot of protection from wind. I would feel comfortable setting up a tarp here but damn was it cold due to the lack of sunlight .. burr. The hike between the two camps is quite short so I found a site, setup camp, then packed up the bare essentials and started hiking out to do the middle section of the “W” which is the “Valle Frances light”. This was by far the most challenging hiking I’ve ever done. I would place it into a group of “technical hiking” I suppose. Lots of lateral movement, ice covered rock, steep icy sections (why didn’t I bring micro-spikes!!! ), slick mud, and one instance where I had to cross a waterfall so I went to a lower much safer area, crossed, then couldn’t find the trail again so I was boulder hoping for the next hour or so. Did some precarious class 3 climbing on loose rock and I was back on the trail again. Just the adventure I was looking for. Quite happy. Due to the slow going icy rock I didn’t make it out to the visa point for Valle Frances Light. It was hard to turn back 1mi or so from the visa but considering my pace, the precarious ice, and being solo I didn’t feel that it was worth the risk. Arriving back at camp I heard others describing the visa and it wasn’t all that much different than where I had turned around at so that made me feel a bit better. Cooked up some dinner and called it a night. The couple next to me in no way could handle the cold. They had a heavy duty tent, massive sleeping bags, big puffy coats, down pants, and those ultra loud space blankets. They made so much noise throughout the night wrestling around then getting up and doing something outside the tent at night I barely got any sleep. If you go, please take the right gear or know how to deal with the cold. The goal for the day was Camp Torres which is just shy of the Torres peaks that I’d need to set my self up for sunrise the next day. So camp Italiano to Torres was the route which is about 16 km of hiking, which, is about like the first day but by no means flat. By this point my crappy map that I was issued to me at the administration was toast. In my mind I thought the trail went to Hotel Torres then up to Camp Torres but that’s not the case so I hiked a bit more which made the day more near 20-22km. Pretty glad I didn’t take the shortcut and went out of my way to trek to Hotel Torres, on the section past the shortcut to Cuernos I saw a Puma! Wow, are they large, lean, and muscular. I stopped in my tracks for a moment and remembered they’re pretty skittish of humans so after it cleared the trail and headed into the woods I got my camera out just in case I’d spot the puma again and continued hiking. Slogging through all the mud up to Camp Torres I ran into another solo hiker from the Bay Area, Menlo Park specifically, just starting his hike from the east side. He was happy to have a conversation in English and I imagine it’s the same feeling I had when arriving to Erratic Rock. Arriving at Camp Torres was a great feeling. Setup camp and hung out with the two polish guys from the first night and they guy from menlo park. It was raining pretty steadily at this time so we all pretty much agreed that the towers wouldn’t be visible tomorrow morning. Set my alarm for 6am (sunrise is around 7:15), and called it a night. This is just a random collection of notes that either don’t fit into the flow of this post or are just small random things I’d like to remember later on. Met a guy by the name of Michael on the plane out of Miami that overheard my conversation and pulled up his laptop with topo maps, pictures, and stories from a trip to Mt. Fitz Roy 4 years ago. Toilets can’t handle toilet paper in about every place I visited. Weather forecast is usually accurate for 2 days. Pretty happy to announce that Aurora has a life outside of burning man / music festivals. She’s been installed in Palo Alto, CA in front of City Hall!!! Here’s a link to the photo gallery with a lot more pics. I’ve been backpacking quite frequently over the past few years so most of my gear choice(s) were dialed in, however, my fitness level and nutritional choices could be much improved. 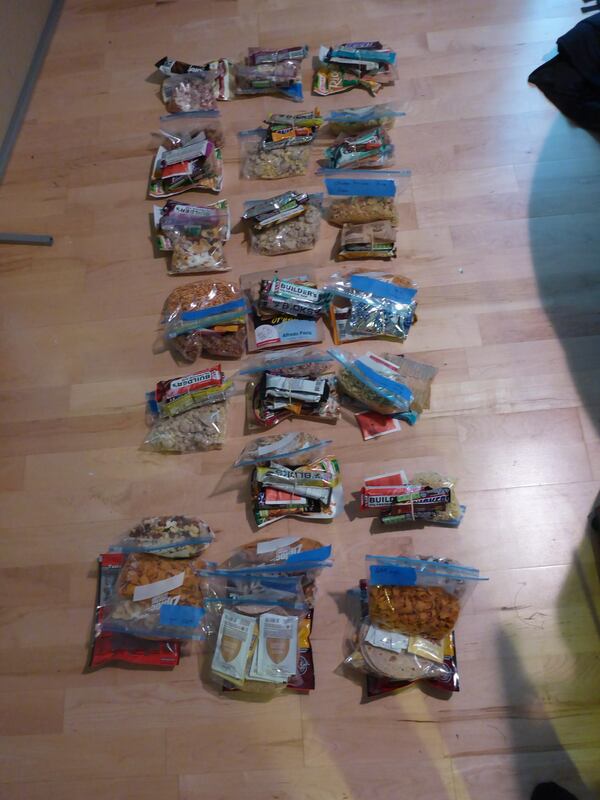 This will be my attempt to document the preparation for a 3 week hike, hopefully it shed’s a bit of light on what we hikers plan/do/consider. Get ready for a lengthy post! With the JMT being such a popular trail a permit is required which has to be applied for 6 months in advance. Yes, 6 months. It’s a bit crazy but after being out there I see why they need to impose such limits. To get more specific the Yosemite Ranger station processes Faxes and Mail prior to taking phone calls so it’s advised that one faxes in the application at the first possible chance 6 months prior to the start date and this is exactly what I did. Choosing the perfect time of year can be a bit troublesome. A balance has to be struck between snow, mosquitoes, general temperatures, popularity, and resupply options. Too late and some of the resupply ranches such as the Muir Trail Ranch may be closed, too early and you may be trekking over snow on the passes, mid-late summer and the mosquito population might be quite high, mid-early season and you’ll encounter a greater PCT population hiking northbound. To each their own but I went for mid summer as the PCT population would be dying out as the mosquitoes were picking up … seemed to workout okay I’d say. 100% public transit which can soak up days. Leaving a personal vehicle at the end then shuttling to the start, also a time sink. Turns out I have awesome friends! Kim was able to drop me off in Yosemite in which she’d be staying at her parents house in Portola, CA (nearby) and Randy was able to pick me up from Whitney Portal. So glad I wasn’t sitting on a bus for hours! I’ll start off my saying that I could’ve done better in this department. While I did make a lot of progress from my initial fitness level I didn’t really train “properly”. So what does that mean? After completing the hike I realized that I trained for power rather than power-endurance. I can hike uphill almost regardless of the grade but when it comes to walking for hours on end with a pack my joints were not up for the challenge. If the hips can’t support the given load/stress that is then directed to the knees which then cascades to the ankles and feet or ends at whichever joint can support the load. In my case I never focused my training on any particular joints other than my ankles which I’ve had issues with for a while. In my quest to lighten the load I’ve converted to trail-runners for all fair-weather hiking but in doing so I had to strengthen up the ankles since boots have been a crutch for a long long time. I built up a bit of flexibility and strength by hiking through dried up river beds at Henry Coe Start Park which sucked at first but paid off when I didn’t have to lug around boots. One misstep in this training was to do it Ultralight, in that, I’d only take 12-15lbs of gear/food/water out per weekend. In reality I should’ve taken 45lbs or in other words, well over what I’d normally be hiking with. The large descents really took a toll on my knees/ankles which I’m sure your familiar with if you’ve been reading along. This was a pretty experimental part of the trip. Up to this point I had only ever done at most a 4 night 5 day hike which doesn’t require much food planning. In the end I decided to carry 2lbs of food per day which amounted to about 2,400-2,600 calories. Any more and it would probably be too heavy or I wouldn’t want to eat that much, any less and I’d probably loose too much weight or not have enough energy. There are other methods to reduce the weight and consume more calories but their mostly unappealing taste-wise. The greater majority of my dinners were freeze dried meals from Mountain House. Originally, I had the grand idea of purchasing a dehydrator and making my own meals but as time approached I quickly fell to convenience so a trip to REI was in the works. With the need to cook every meal I wasn’t sure how much propane to take so I grabbed one medium sized msr can (13.1 oz net weight) and one smaller can as a backup. It turns out the one 8oz can cooked all my breakfasts and dinners for a total of 32 uses. I’m still amazed that it lasted that long, it’s almost unbelievable. Here’s the gear list in true spreadsheet form 🙂 The weight is omitted for items which I’ll have on my person. I’ve also excluded quantity since I rarely carry multiples of a particular item. Trying a few new things here, sorta. 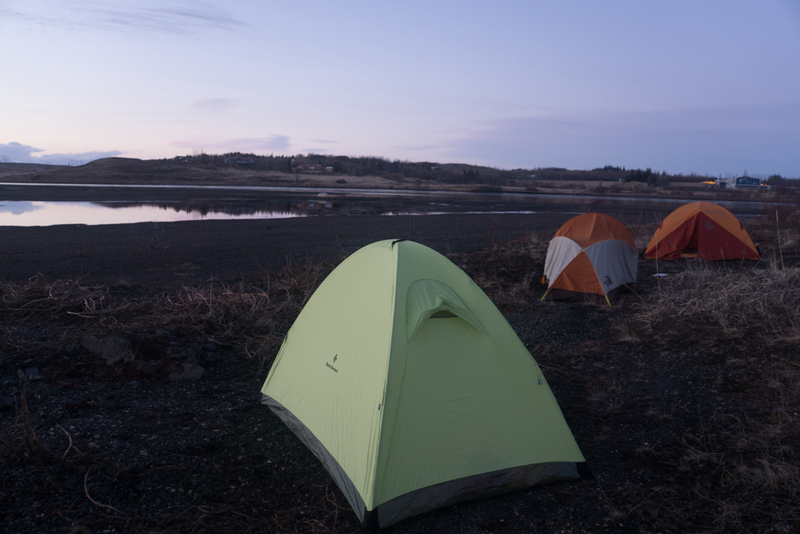 The tarptent is a non-freestanding structure which requires the use of a hiking pole for the setup. Originally I was going to use a tarp which I’m familiar with but with the mosquitoes on the rise I decided on a tarptent. 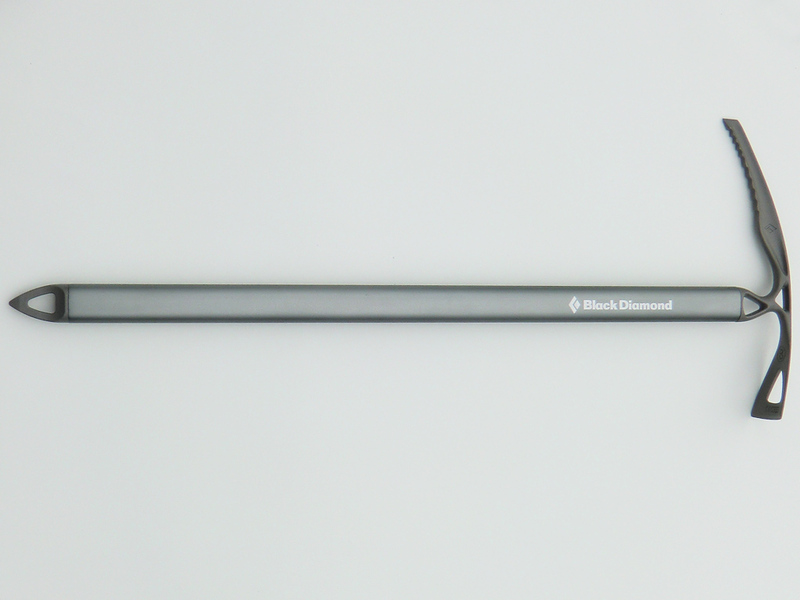 Obviously this can only be pitched in areas where stakes can be used or in some cases large rocks. Overall, I never had an issue with setup. I also opted to use a backpackers quilt since they temperatures wouldn’t be all that low (low 40’s at the extreme) and it’s significantly lighter than a mummy bag. With campfires being banned along most of the trip I opted to bring a much larger pot to cook up some fish. With a larger capacity over a smaller jet-boil like canister it also allowed me to heat up all my water at once, keeping fuel efficiency in mind. With this being my first long distance hike I was unsure as to how much fuel I’d go through so I brought a smaller backup canister which would most likely hold me over till the next resupply. Turns out I never used the smaller canister, all 32 meals (dinner and a few breakfasts) were fueled by the one 13.1 oz MSR canister which still amazes me. All my dinners were of the freezer-bag style of cooking in which I made a cozy to keep in the heat while I eat (Pics of the cozy at the bottom). Not much to say here besides a few modifications I made to my Sawyer Squeeze filtration system which you can see below. Camel-bak 1 2.6 96oz capacity. 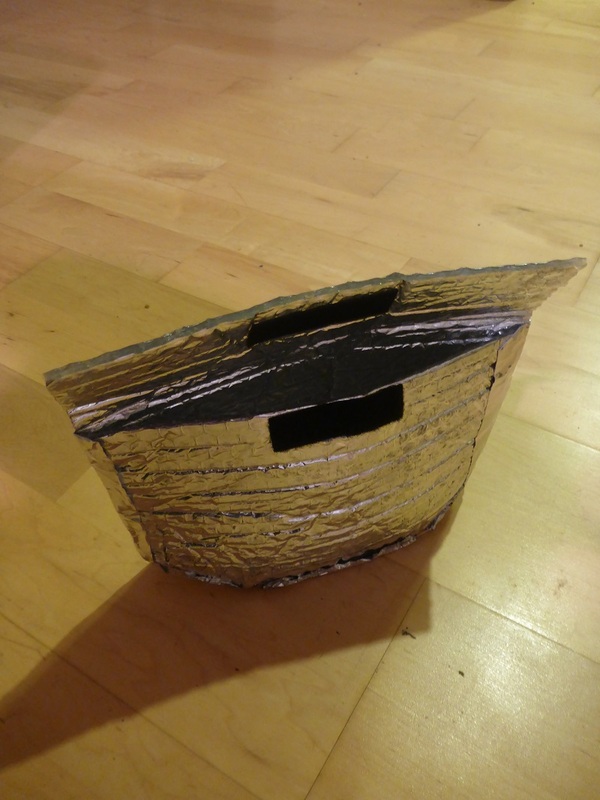 Collapsible. Body glide is important, never leave home without this kids! A few things here. I called my camera battery consumption almost spot on, ended up going through 1 battery per week with an average of 40 pictures per day. My entire fishing kit was just over 5oz which I find pretty great…. lots of enjoyment with almost no weight penalty. Lastly, the bear canister was the BearVault BV500, I just couldn’t bring myself to purchase the Wild Ideas Bearikade (crazy expensive cylinder). Generally, gear worn on oneself isn’t included in the pack weight so that’s why it’s been omitted from the Clothing total. I’ve noted which items are included below. At first I cringed at the thought of spending $30 for a pair of boxer briefs but I’ve gotta say, it’s well worth it … go out and grab those Patagonia Cap 1’s like there’s no tomorrow. At night I’d always wear some very loose fitting socks to help with circulation and let the feet breath. It was also a pretty good idea to keep the feet elevated a bit to cut down on the swelling which builds up from being on ones feet all day. For the little bit of nasty weather or cold nights I’d layer the fleece along with the rain jacket to create a super warm and moisture wicking system that worked remarkably well. Made a few tweaks to the water filter which I don’t regret the least bit. There’s no reason NOT to make these adjustments if you own one of these. 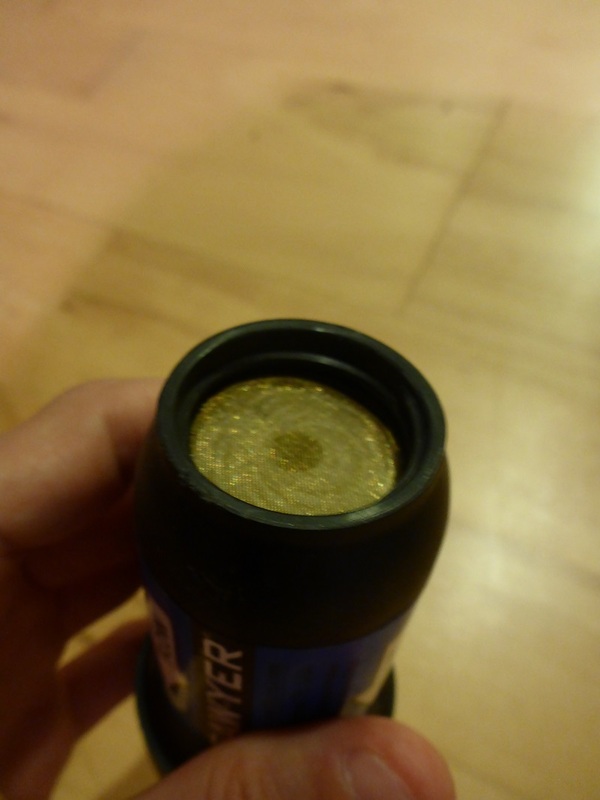 Replaced the main cap with a “Smart Water” bottle cap which is way better than the original one. 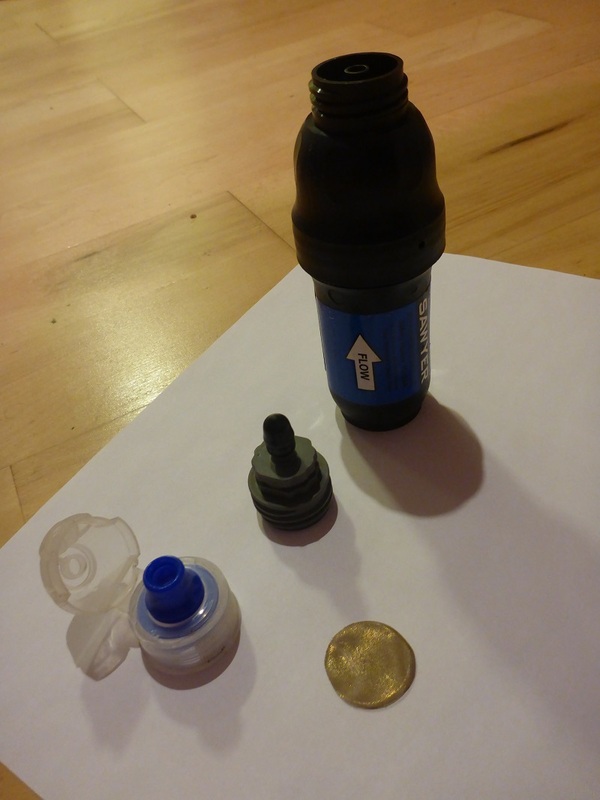 Punched out the the nozzle on a second “Smart Water” bottle and brought it along in case a black flush would be necessary. The punched out one snaps right on to the main cap which allows one to use any standard platypus style bag to do the flush and leave the huge syringe device at home.